Two beautiful samples of the Magic Rectaflex.. This page is now near complete as to presenting all main Rectaflex series. 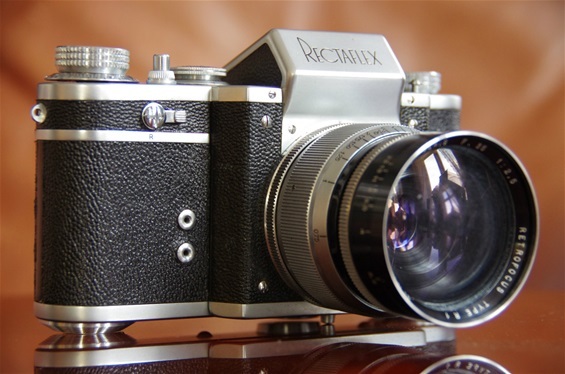 Probably the most informative online presentation of world's first series produced Penta Prism Single Lens Reflex camera..
1949: April: series Standard B.2000, sn from -2173 to somewhere close to 3000. 1950: Unknown date: Very few B.5000 produced. Only 2 samples known? B.5122, B.5124. 1951: From June till December: test series 20000 B; sn. from 20101 to under 20350. 1952: From September: series Standard 25000 B/25000. From 25001 to close to 29500. 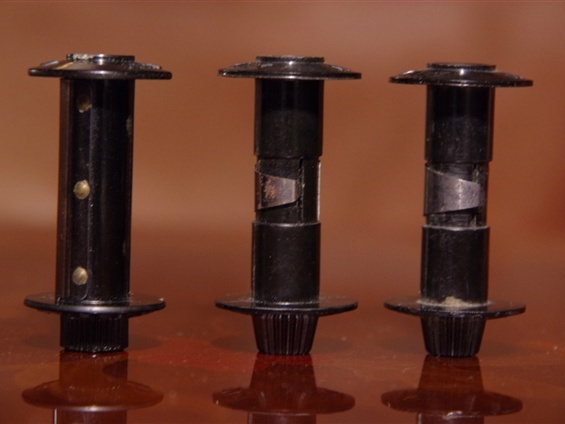 1952: From June through 1953: the very special 3-lens Rotor. Some 50-75 units built. 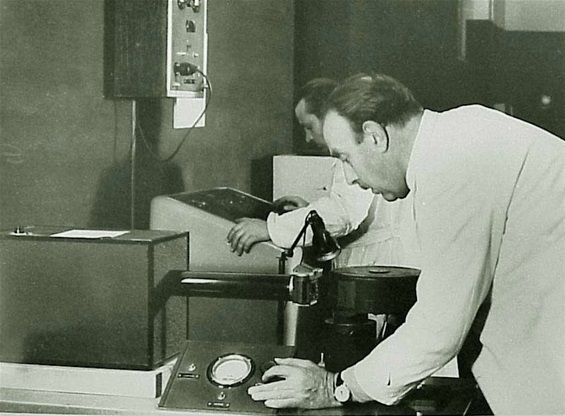 1957: Production of new prototypes 40000 series in Rome. Only 12 produced. 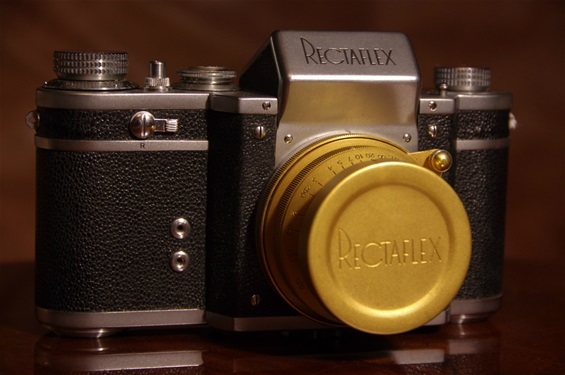 Aside from the Standard series (A.1000 to 30000) Rectaflex produced some special series, consisting of the Junior series, the Gold series, the Air Force series, the 24x32 frame series and the Rotor series. There were also some very few black houses within the Standards. This information is mostly based on Marco Antonetto's very detailed book "Rectaflex- The Magic Reflex" of 2002. The B. 51xx samples are not mentioned there. Other special and limited series may also turn up in the future as examples of the company's strive to meet special needs in special markets. 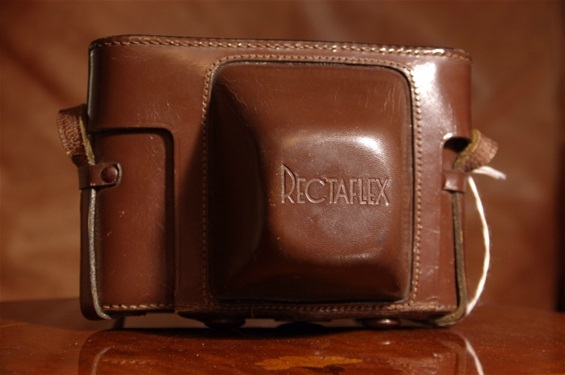 The Rectaflex features a trigger related mirror - TRM - that follows the movement of the shutter release button (trigger), with a finder going gradually black as you press the button and opens as the button goes back to normal position. Not as fast as the IRM, but far better than having to rewind to see the subject through the finder. The shutter speeds range from 1 to 1/1000 second, latest versions had 1/1300 and Junior version had 1/500. It also featured a kind of 45-degree cylinder split image focusing system, introduced from around A 1250, that is already from 1948. 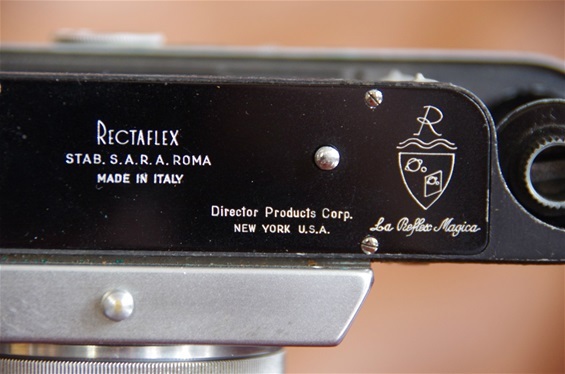 As Rectaflex had no intentions of producing lenses of their own, many independent and famous optical companies queued up to produce for them, like Angenieux, Berthiot, Royer, Schneider Kreuznach, Kilfitt, Carl Zeiss Jena, Steinheil, Voigtlländer, Filotecnica Salmoiraghi and Old Delft. Rectaflex then rebuilt them to fit their own mount. 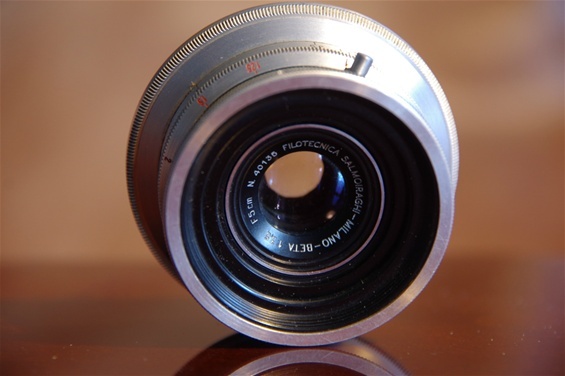 Some West German camera producers, like Leitz, would not deliver lenses, or at least hesitated to do so, as they soon saw the Italians as hard competitors to their own cameras. Would Ferrari ever deliver motors to Mercedes? 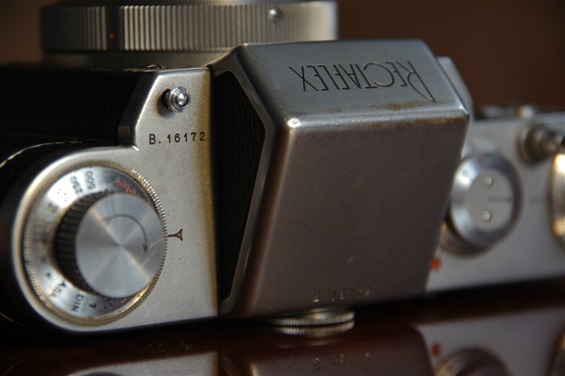 A very early pre-series 947 prototype with film cutter and no rewind knob. Also note the slow speed shutter control on the front and the lightly framed logo. For multiple reasons not in my collection. The final logo from first to last series produced camera. 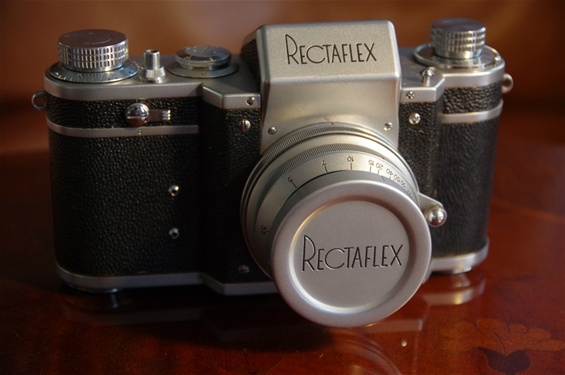 The first series produced Rectaflex was the A.1000 series of September 1948. Some 1150 copies were produced until December. 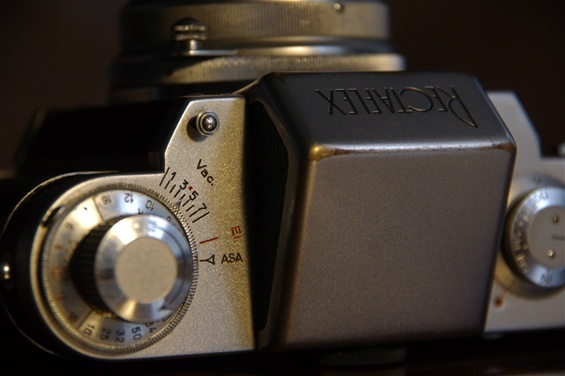 Due to some problems with the quality of the long shutter times, a major part of them were held back at the factory, while most of the ones sold were called back. 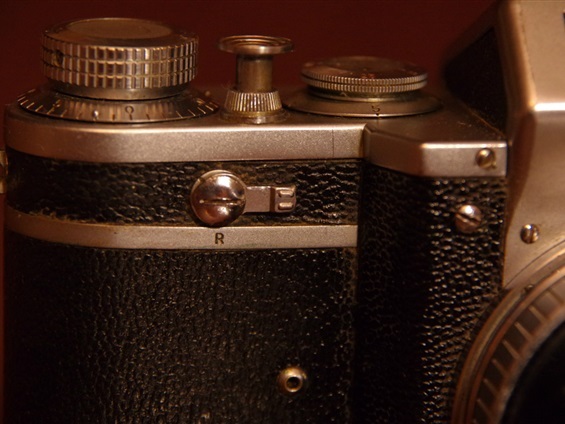 The bodies of these cameras were later used for the production of the Junior series in 1950. 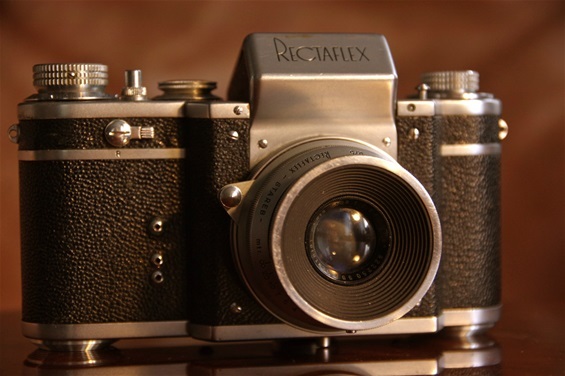 The letter A before the serial number indicated the first version, the ones with film cutter.Of the cameras produced, only some 250 samples ever reached the market before Rectaflex discovered the problems and stopped exporting and producing. Those already exported (only very few were intended for the home market), were returned to the factory. We do not know exactly what the facts are concerning this first wave of cameras, but some were probably sold already. Were they all returned? If not, how many remained out there? France and the USA were the countries to receive the first export. Are there still some out there? A body from the almost non-existing first Rectaflex series. They were produced from September 1948 from sn 1001 to some 2150, with 2127 as the last known number. This very copy, with the low serial number, was probably built during the first month of production, that is September 1948. It was among those to be exported, maybe even sold among the first ones. So, is it an original A. 1000? As one can see, I have left out the detail that could prove it: the film cutter. As I have left out the detail that could prove it is not: the Jr. button blinding the hole. What do you think? The answer lies in another detail. Look to the right, to the dial under the fast speed setting knob. Two numbers are visible, the 11 and the 14. Those are DIN numbers, not slow speed numbers as on the A. 1000 series. 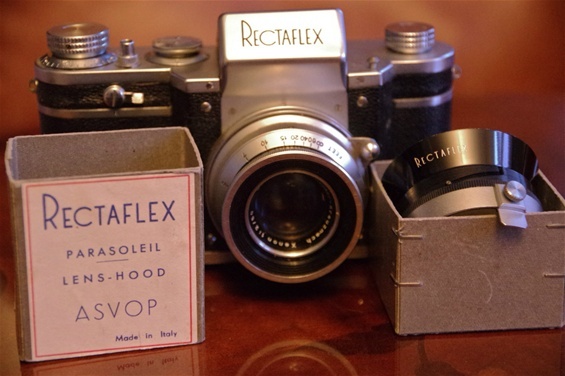 So, this is a Rectaflex Junior with a house produced September 1948, exported during that or the following month, may be sold, maybe not, and returned to the factory to stay there until 1950, when it was rebuilt into a Rectaflex Junior. Note that the serial number on the house is marked with N. before the number, while the number on the prism house was marked with the letter A before the same number. This system officially continued on later B-series up to B.16000 series. However, there was an undescribed special series, the B. 51xx, that first introduced this. The second series in the Rectaflex line was unofficially called the 2000-series and given a B before the number. The letter B indicated a second series. They had the same bodies as on the previous series, but without the film cutter, or even the hole for it, and also with some inner corrections made. Still, the bottom of the camera was maintained as on the A. 1000 series. 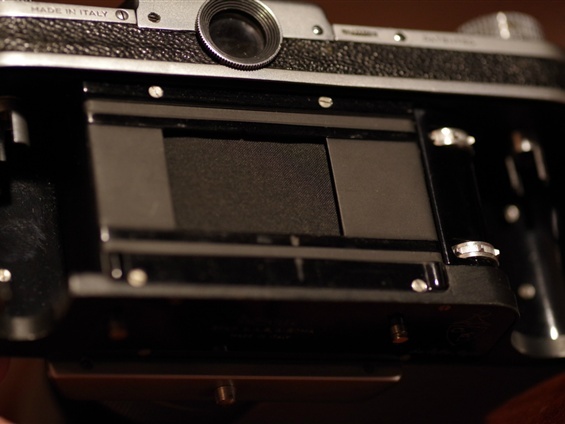 Besides the lack of film cutter handle on the left side of the top plate, the only externally visible change was the somewhat different look of the back wall opening handle on the base plate. Internally, there were some small changes. During the production of the B. 2000-serie,s there was an ongoing development, especially as concerns the pentaprism. But officially, this came with the next series. As Rectaflex very soon discovered problems with the long shutter speeds on the A. 1000 series, the major part of it, not yet being sold, was held back in the factory. The ones already sold, some 250 pieces, were called back for modification, and a major part of them returned. The A. 1000 series numbered more than 1000, thus having serial numbers up to 2127, as the last known. The ones kept in the factory were rebuilt into later versions, most of them to the less expensive Junior model a couple of years later. Because of this, the next series, called the B. 2000 and starting with 2173 as the lowest known number, is the oldest series one can expect to find today. Samples from the A. 1000 series may still be there, but in extremely low numbers, if at all. So, my samples, nos 2173 and 2238, may be among the earliest ones still around. More than that: They both work perfectly, and especially the B.2238 seems flawless! Serial number B. 2173. 60 lower than the "lowest"! 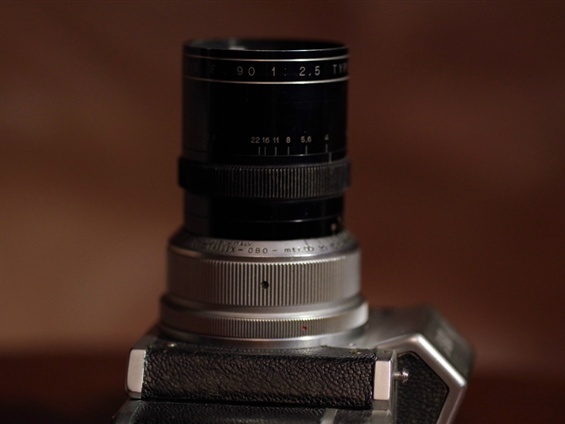 So, this copy is definitely among the oldest pentaprism SLR cameras around. If the A. 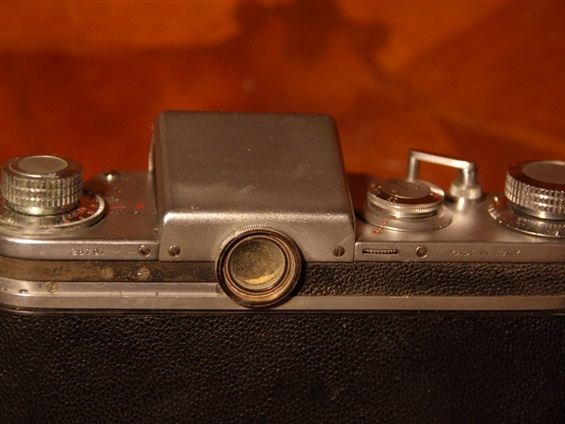 1000s are all gone, there were only very few B.2000 cameras produced before this one in April 1949. If any. 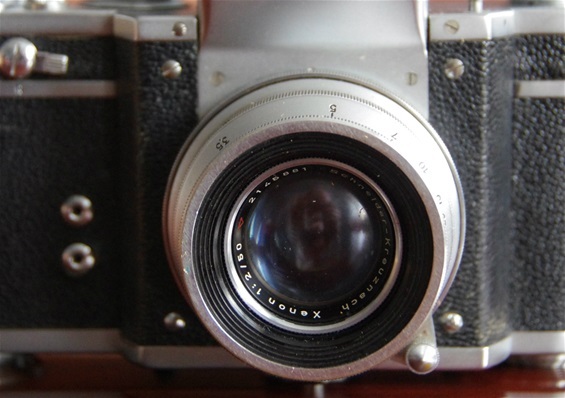 Lens is P. Angenieux Paris 90/2,5. Sn. 160974. I heard rumours about this camera. It was real! Both curtains are almost as they were in 1949! It came with a magnificent lens, the P.Angenieux 90/2,5. Sn. 160974. The wonderful B.2238. This is how it came. After 64 years... The original box a bit worn. What would I find inside? The first series had a film cutter. This one hasn't. One of the changes from Standard 947 and A 1000. A very clean layout. 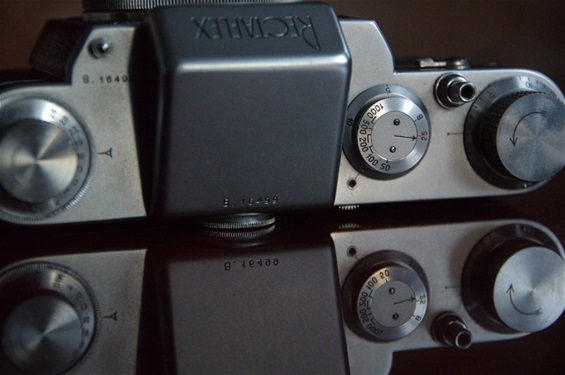 Shutter speeds from 1 to 1/1000 second, split into two units, one operated from the top and one small dial from the rear. Size: 152x90x48mm. Weight:664 grams. Prism house height: 17mm. 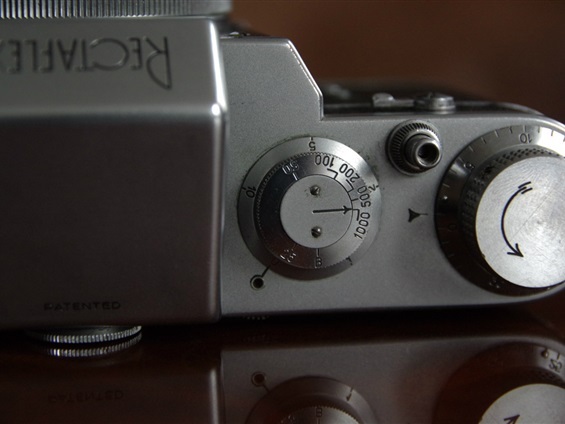 The little dial on top of back wall regulates long shutter times seen as 0 and 1 (second) digits on the disc under the short shutter time dial. 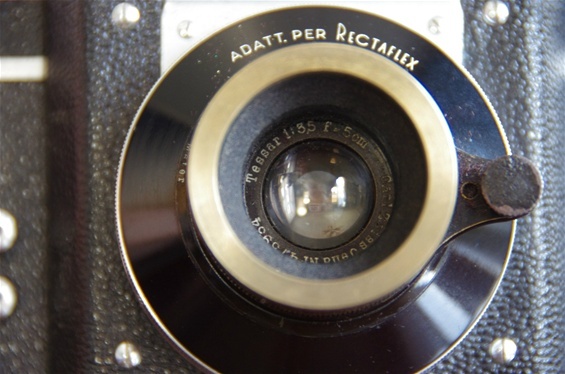 As Mario Antonetto claims the lowest known sn to be 2233, this sample would probably be one of the earliest serial numbers remaining of Worlds First Penta Prism Single Lens Reflex camera...! Until I came across another one.. See below. Not even a scratch. Base plate/back door opener to the left. To be turned 180 degrees. When doing so, this is part of what you see. Not marked for export. 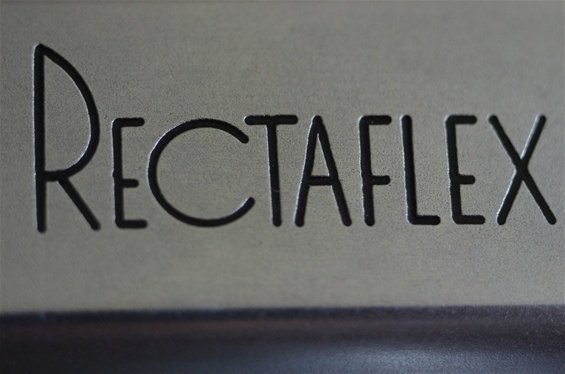 The Rectaflex logo including La Reflex Magica. 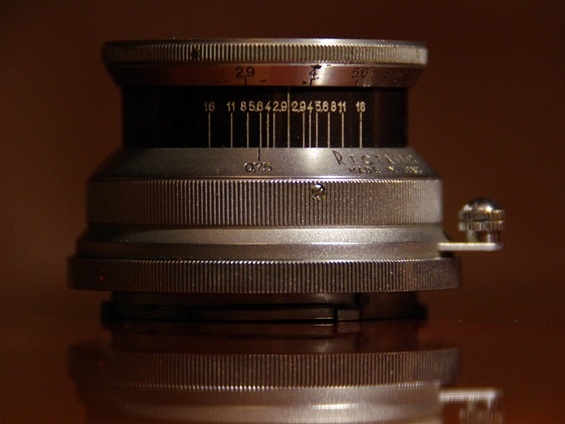 The lens: a little jewel from Carl Zeiss, Jena. 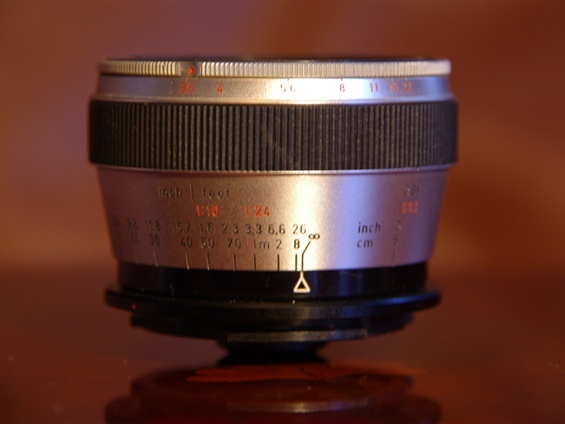 A Tessar 5cm/3,5. Sn. 473934 . As far as I can see, this one is not mentioned among the regular lenses in Rectaflex literature. So, probably a special adaptation, but done at the Rectaflex factory. 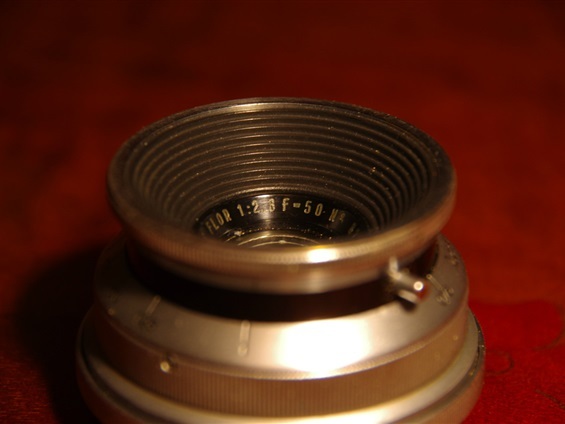 The lens has a very old style, even some kind of threads that become visual when turning the focus handle. They are not ordinary threads, rather a way to prevent dirt from entering the lens when compressing it, as the lens does not rotate. 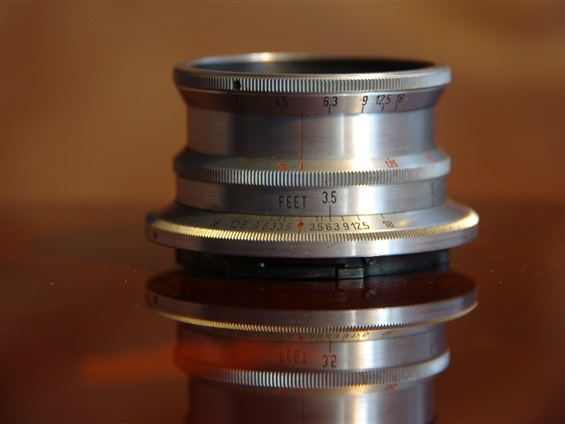 World's first wide angle lens for SLR camera: the famous Angenieux Paris 35/2,5 Retrofocus! Sn. 181428. Another B.2000 camera, sn 2676. 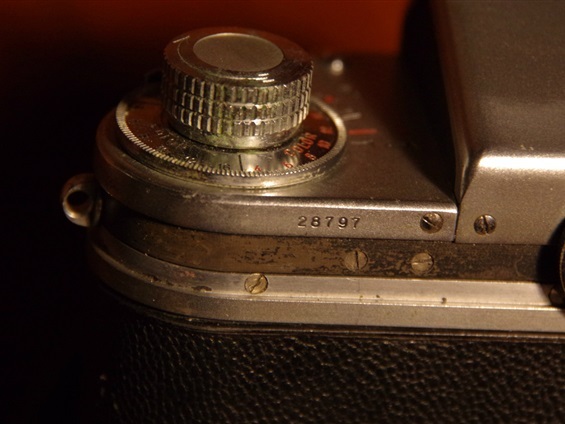 Note the flash contact glued very neatly to the prism top. Probably done as a special order at the factory. The B. 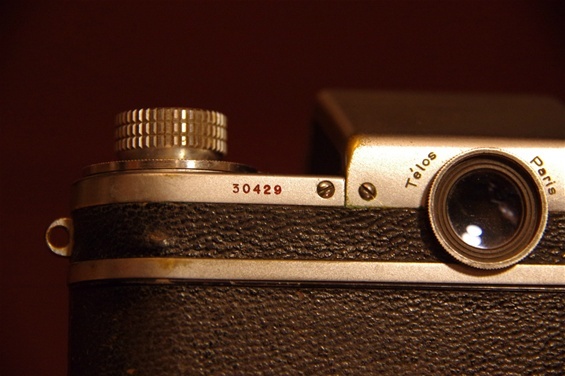 3000 series, starting with 3001, was produced from September 1949, about the same time as the Contax S started production. The new series represented some changes from the outgoing B. 2000: First of all, the pentaprism had undergone some development through the year and they were officially presented with the B. 3000. By replacing the sides in the prism with newly developed convex sides, the image was seen bigger and brighter. This led to a somewhat bigger prism house, being 2 mm higher than the previous ones. 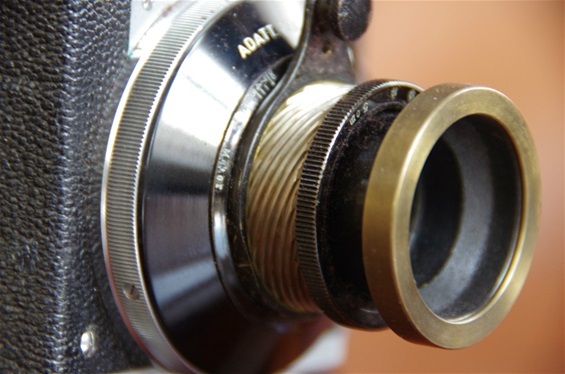 To stabilise the film cassette and eliminate the danger of twisting the film, the bottom of the film cassette well was made more open so that the spool of the cassette could rest on a small aluminium cylinder being attached to the inside of the base plate. The sn. on this Rectaflex is B.13255, a number that should not exist. There is a gap between sn.B.4480 (approximate end of 4000 series) and 16001 (start of next series.) No sources ever mention any sn. like 13xxx. But there is an answer to this quiz: as cameras between sn. 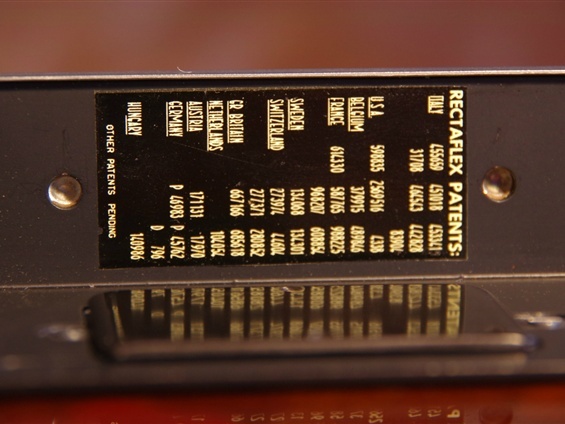 2700 and 2800 and between 3200 and 3420+ were exported, the first ones to Great Britain and the later ones to the USA, Rectaflex marked those by adding a digit 1 before the regular sn.! And suddenly my first Rectaflex is not an unknown one, but a part of the 3000 series produced from September 1949! Hard to find any differences between the B 2338 and the B 13255 on the outside. 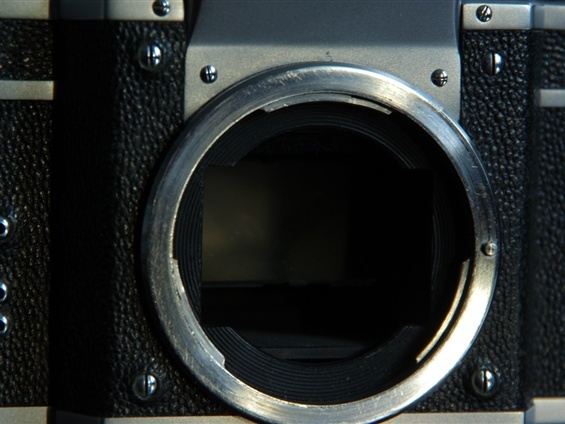 Until you look closer and find that the pentaprism rises 2 mm higher! Size: 152x92x48mm. Prism house height: 19mm. Weight: 676 grams. 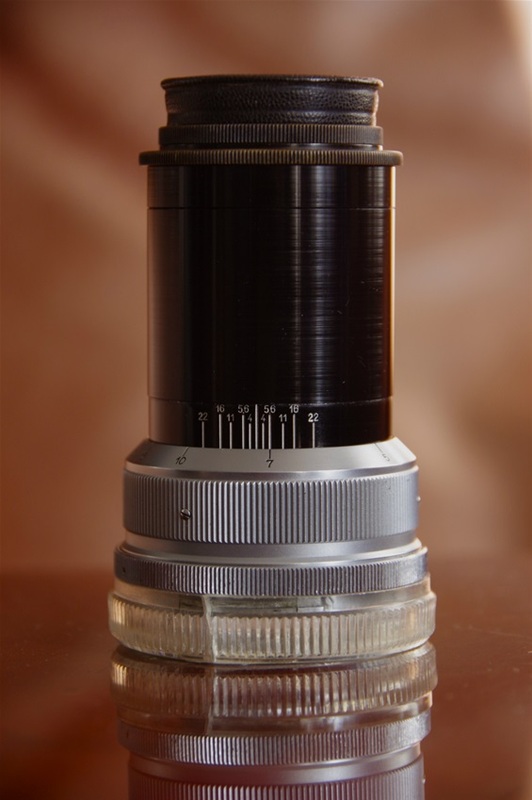 This Schneider Kreuznach Xenon 50/2 normal lens was probably the most common lens to follow the Rectaflexes, through almost all the years of production. 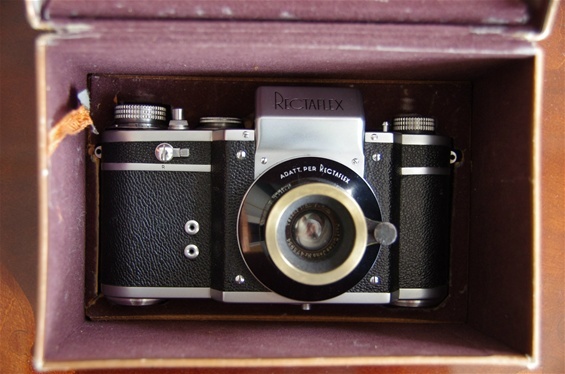 Still, it was ranking higher on the price lists than both SOM Berthiot 50/2,8 and Angenieux 50/2,9. 6 elements in 4 groups. Sn. 2145881. Studie of the serial number. From the B 3000 series, added the digit 1 for export to the US. Close-up on the long shutter time dial. Imported to the American distributor Director Products Corp. The B.4000 series, introduced from June 1950, was called the Duo Focus. The prism had been improved from the last B. 3000 cameras, in fact from late B 2000, by changing the second side in the prism from flat to convex, making the viewer even brighter. The name Duo Focus was pointing at the fact that there was a combination of two systems. 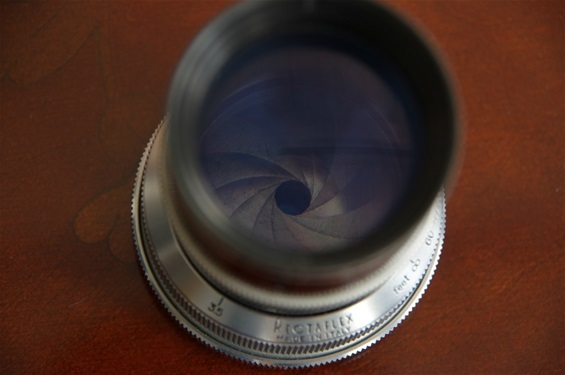 First, the 45-degree split image system that broke any line in the centre of the motive until it was in focus, plus the more traditional focus system . In fact, the Duo Focus system had been there from later A. 1000 cameras, but improved through the B. 2000 and B. 3000 series, the later leading to a third convex side in the prism that was officially introduced with the 4000 series. 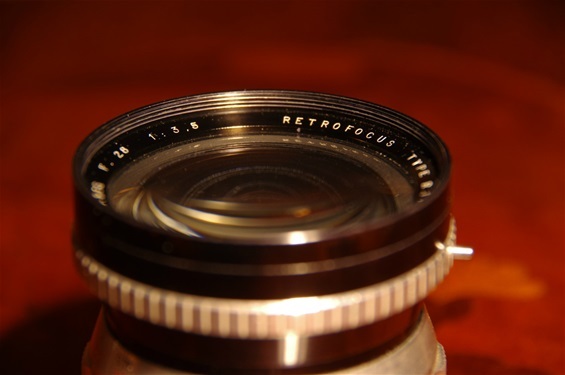 Mechanically, the only improvement from the previous series was done to the lens mount and the long-time curtain gears. The possible explanation of the Duo Focus name being introduced on the B. 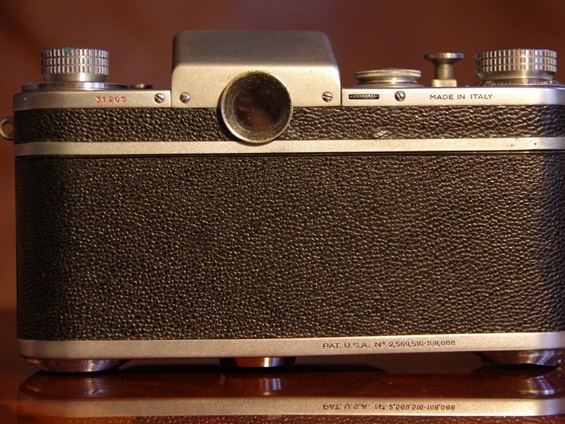 4000 series in 1950 is the competition that came from the Contax S at the same time, during its first year of production. 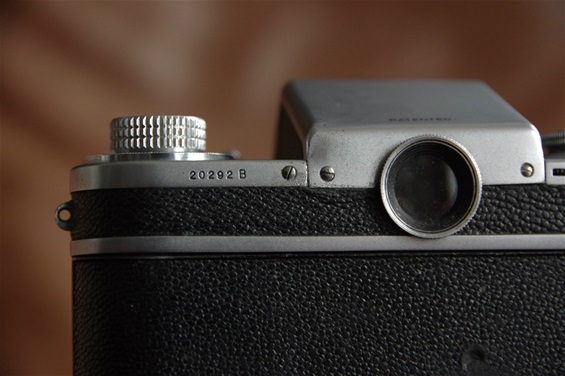 The East Germans had the name and the production skills, while the Italians had a more advanced camera with the trigger related mirror and the Duo Focus. So, they needed to tell the world about it. There was also a special folder explaining it. The production of B.4000 series rose to only some 480 pieces, ending at roughly sn. 4480. 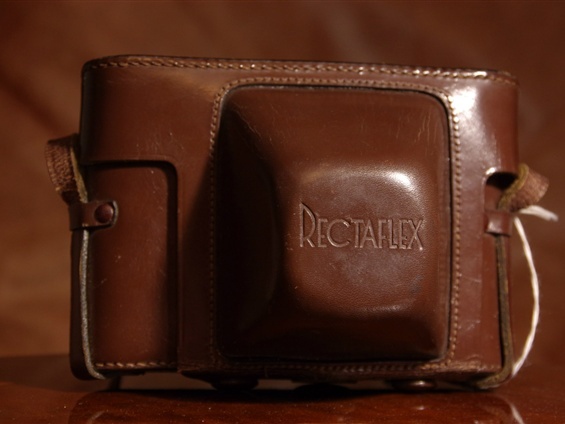 The Rectaflex Standard B. 4000 with Angenieux 35/2,5 Retrofocus. 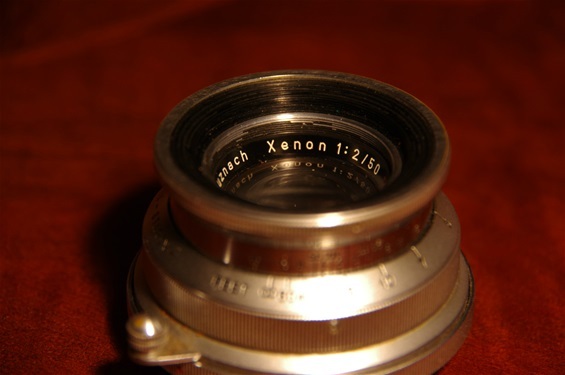 This lens was introduced late '48, but available from 1949. Camera has sn. 4398. As usual, not much news to be seen from the front of the new model. The visible news on this camera in fact officially belonged to the next series! The ASA/DIN reminder was announced with the B.16000 series. Could it be a test of what was to come with the next series, the B.16000? More likely, the owner had the camera serviced and upgraded it at a later point. This is a factor that one must bear in mind whenever coming across a hybrid of old and new. Which goes for all technical devices. And more than that. Even human beings!?! From what we know, the B.4000 series was produced in less than 500 copies. The next series was called B.16000. But in December 2015 a camera with the sn. B.5122 appears on an international auction. And soon after, another one numbered B.5124. Marco Antonetto, in his very thorough research, does not mention it, and I, during my time as a collector, have never come across it. But they both exist and are now parts of this collection. So, what is the story behind them? Whether this is an until now unknown special series, repairs that were given new numbers, a part of the B. 4000 series that exceeds the production numbers given in any literature, or a very limited test series, will have to be investigated. So, the "not existing" B.5122 has arrived. And shortly after, the B.5124! Firstly: They are not B.4000s with high numbers. These cameras are not like any of the other series. 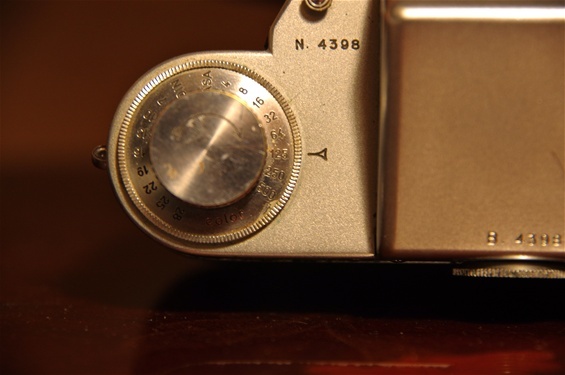 The difference may be small, but at least on the outside, there is one: All series from A.1000 to B.4000 had two serial numbers engraved, one at the top plate, behind the lens release button, and one at the rear of the prism house. The latter had the A or B before the number, while the one at the top plate had an N. The two B. 5000 samples both have the numbering of the B.16000 series, that is a B before both numbers. But they are not like the B.16000 series either, since they have the two flash contacts from the earlier series, not three as on the B.16000 and B.20000 series. And they have the lens mount of the B.4000, not the improved one that came with the next series. This may seem like minor details, but they are important, as they set them apart from all other series. As shown under, there are other details too, clearly placing these cameras between the B.4000 and the B.16000 series. Early June 2018, a hybrid Rectaflex was sold through eBay. 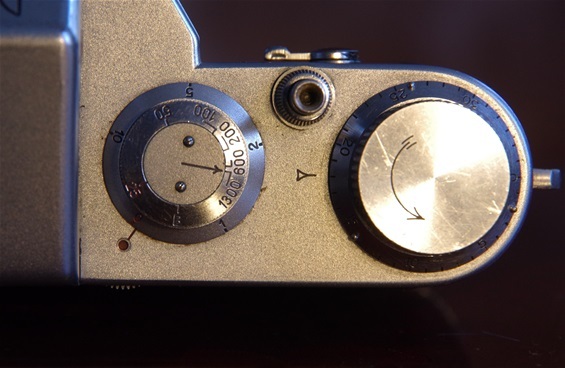 Parts of the body were from earlier series, while the top of the prism house (no engravings on it), the shutter speed dial (1/1300) and the shutter trigger (mushroom type) were of 30 000-series design. The serial number was hard to read, but the seller declared it to be N. 5905. 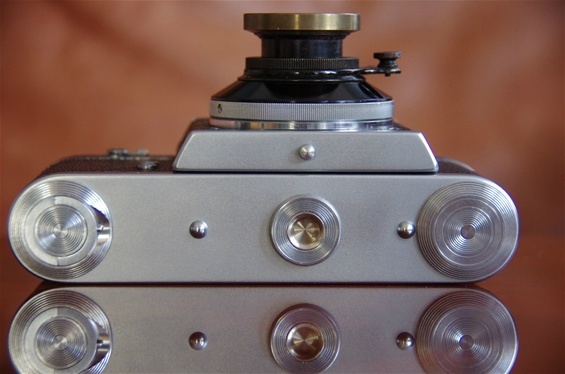 This camera may be a repair, built on an elder camera. The left top plate, where the rewinder knob is placed, may have been shifted, and a new, unused number engraved. Or it may have been assembled from different left-over parts in the factory during or after the collapse of the company. Otherwise, the number 5905 makes no sense, as it was never included in the series production. 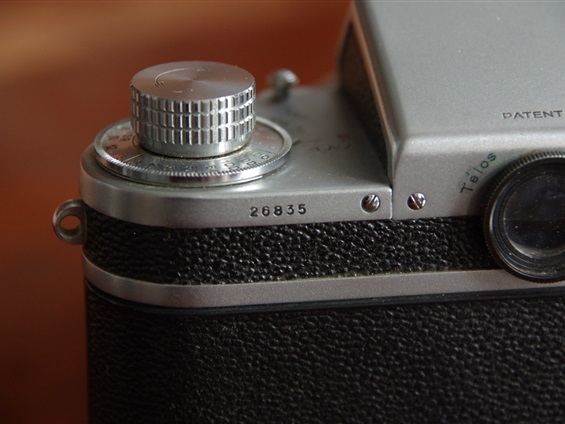 The very few 5xxx-series cameras known had numbers just over 5000, as shown here. Or, the whole thing is just a fraud, put together outside the factory. That possibility kept me from bidding. Anyway, the "5905" is not a representative of any official or unofficial model. Here is the proof: the B.5000 variant exists! Note the B before the serial number on both places. This is about as rare as it can be. An until now unknown Rectaflex series with a P. Angenieux Paris 50/1,8 golden lens! 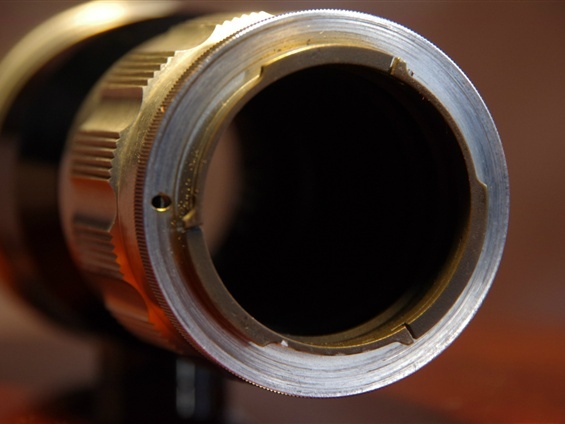 This lens was originally made for the Golden series, of which only seven are known. It may be one of those seven, that later, for some reason, landed on this ultra rare house. Or it was kept in the factory in case of more golden houses and ended up being sold as this combo. Se more under Rectaflex Gold and Rectaflex lenses. Concerning the house, note the two flash contacts as on earlier series, not three as on the next one. The B.5124. A bit more worn than its brother, but with all functions intact. The shutter works at all speeds, with clear differences, although a bit slow. 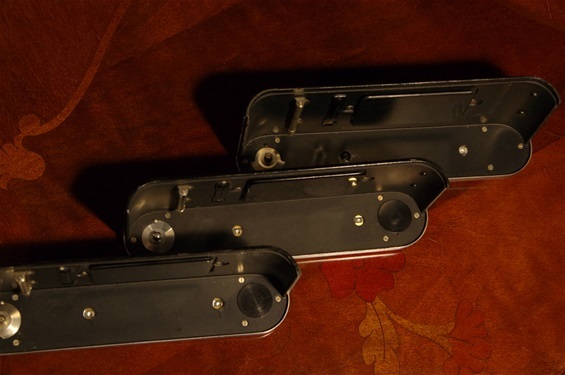 Here are the back pieces of, from the left, the B.4398, B.5122 and B. 16499. They are all different. The B.5122 have some features from the B.4000 series, but also some from the B.16000 series. 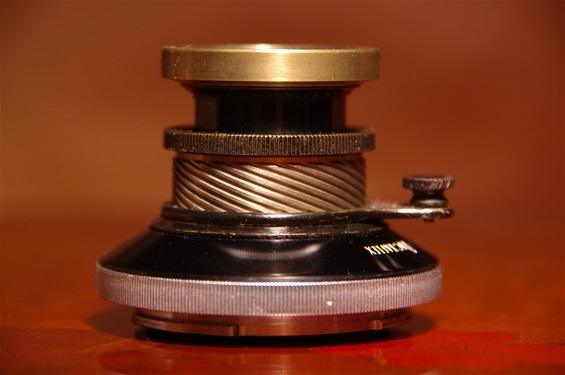 The reinforcement under the take-up spool is inherited from the earlier series, while the small knobs on the inside of the back wall curve are like the later series. The take-up spool is also different from the B.4000 series, as seen under. From left: B.4398, B.5122, B.16499. 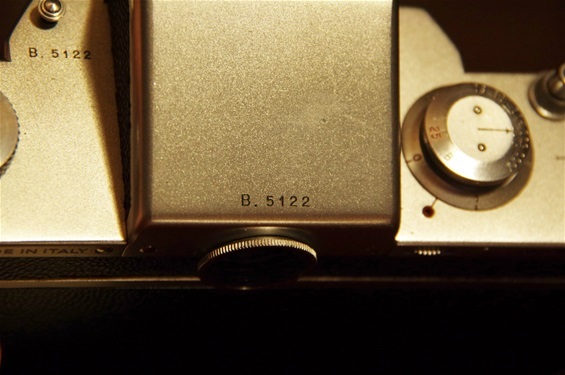 The B.5124 with Carl Zeiss Tessar 50/3,5. Rare on Rectaflex. Only the B.4000 series and these B.512x samples have this mount with 4 visible screws. This is the mount of the B.16000 series. It was further strengthened from the former series, but with no visible screws. 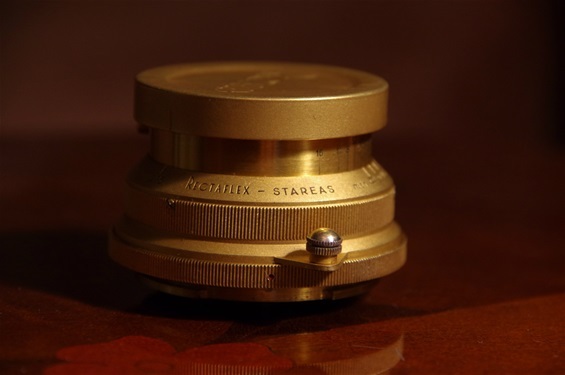 The Angenieux Stareas 50/1,8 - in golden finish! 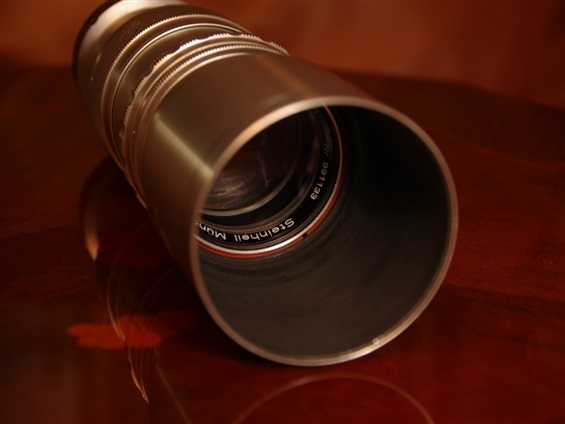 The lens will be described under Rectaflex Lenses. 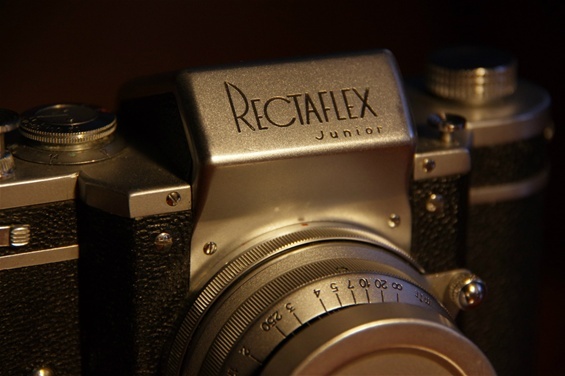 After having discovered the long shutter time problems on the A.1000 series, Rectaflex might have just repaired them before sending them to a market that was so eager to get them. But Telemaco Corsi was already into the next generation cameras, and the A.1000 cameras belonged to a passed stage. So he a and the rest of the leadership found themselves sitting on several hundred houses that they at first did not intend to use. This is typical to they way the company was run. Production was changed all the time, giving room for new inventions but also slowing down the production capacity. There are reports of machines being ordered for improved production, but never even used because new ideas made them old fashion before they entered the factory. The machine costs were phenomenal and production low. So, Telemaco Corsi needed to do something with the A.1000 houses. 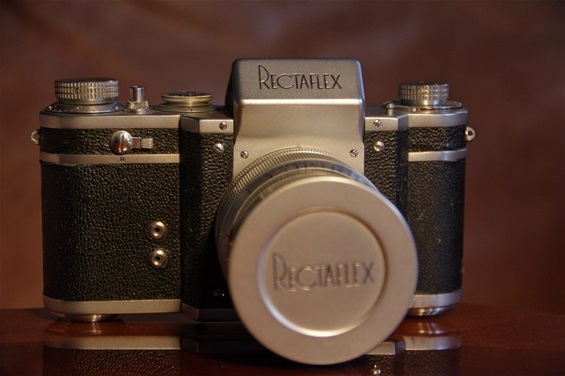 As the price of the Rectaflex was relatively high, he saw a market for a less advanced and less expensive model. So, the Junior series, based on the A.1000, was introduced in September 1950. 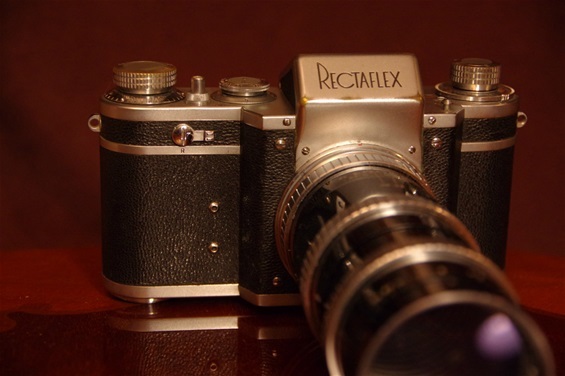 The Rectaflex Junior of 1950: At last the remaining houses made in 1948 could meet the market, although modified. Size: 152x91x48mm. Prism house height: 18mm. Weight: 662 gr. 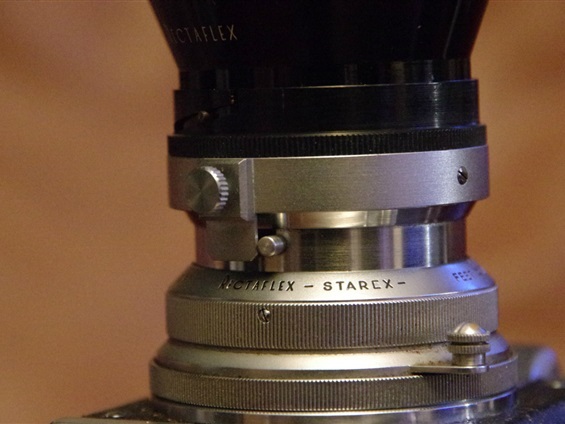 Here with one of the most common lenses for Rectaflex, the Angenieux 50/2,9. 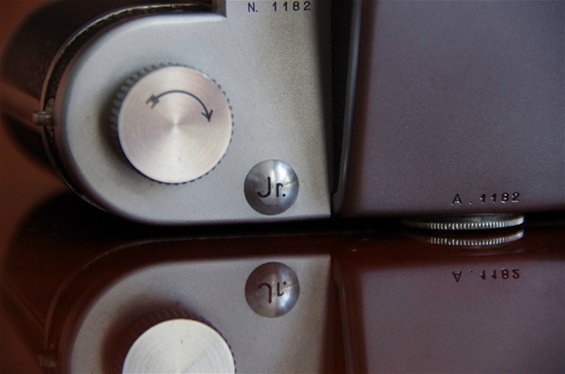 There were several changes from the A.1000 series to the Junior: the film cutter was removed, but the body was the same, so the handle was blinded with a button, wearing the the letters Jr. But the body shell itself was maintained, except the name Junior under the Rectaflex name in the prism front. 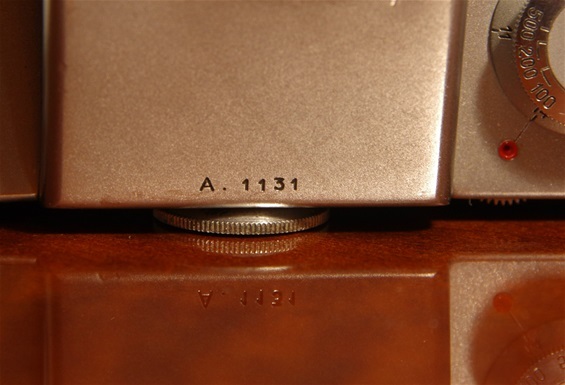 Even the serial number from 1948, the A 1000 series, was there. This sample is among the early ones without the split image focus system that came around sn.1250. A. 1182: An original 1948 body. Remainings of the first ever PP SLR series. A detail, seen on some Junior cameras around this sn. : The mushroom shaped trigger. This was officially introduced on the last Rectaflex series, the 30000 series in 1954. A unique link between the first and last series! Also, note the lack of long shutter times. They are replaced by a DIN reminder scale, operated by the same dial on the back as on other models. There was a big leap in serial numbers from the last of the B.4000 series to the next series, called B.16000. * Production started in April/May 1951 and ended in April 1952, the last known sn. 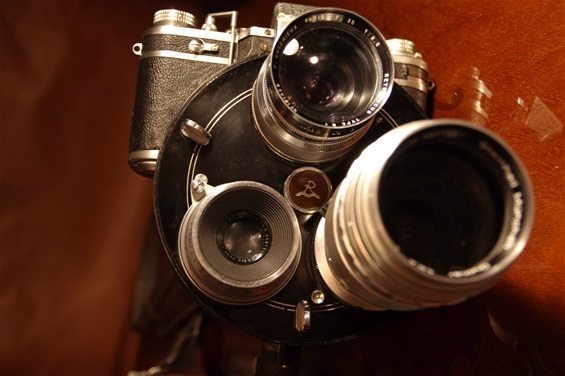 being 16862, There were many smaller improvements being introduced with this series, such as a new, more flexible mirror housing, a further improved lens mount, internal matt blackening to avoid damage by any stray light, new film plane plate, improved film transport system. 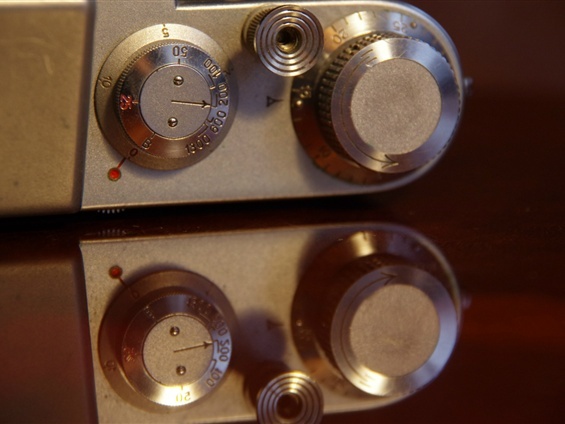 The most visible improvement on the B.16000 series was the third flash socket added to the two sockets from previous models, and the film indicator dial at the top, placed under the rewind knob. 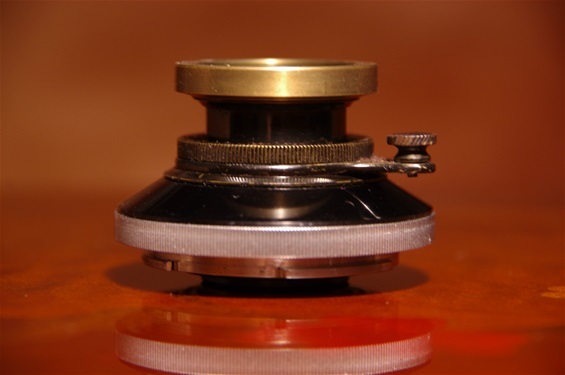 The rewind knob could also be lifted, resting in the upper position. 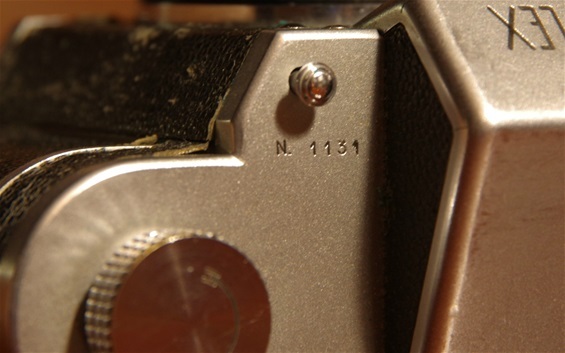 Also note that the serial number on the body now followed a B, as on the prism house, not an N as on models up till now. December 2015 has disclosed a model B.5122. AND B.5124! As these are serial numbers that ha not been mentioned before, as far as I have experienced, this will have to be investigated. There were some changes from B.4000 series to the B.16000. A third flash socket was the most visible news on the front wall, allowing flash bulbs and electronic flash, however again abandoned on later series as systems improved. This sample has sn. 16172. The lens that followed was the SOM Berthiot Paris Flor 50/2,8. 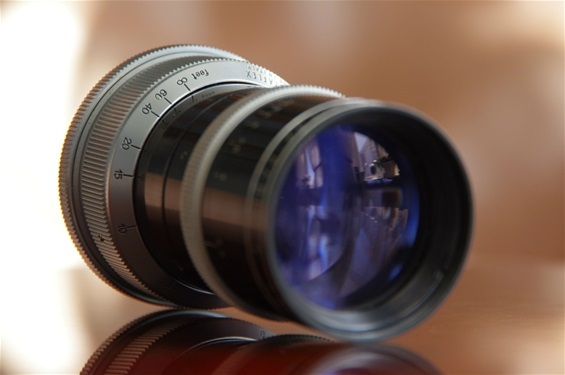 A rare and very expensive lens now, but in fact lower priced than the german lenses at the time, and higher priced than the Angenieux 50/2,9. Sn. on this one is 822250. A very well working sample! 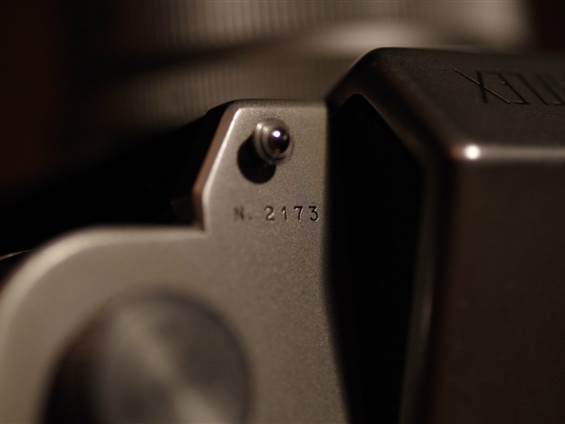 On the top plate, the film speed reminder was officially introduced. The edges of the prism have been worn after contact with the case. The rewind knob could be lifted into a fixed high position. 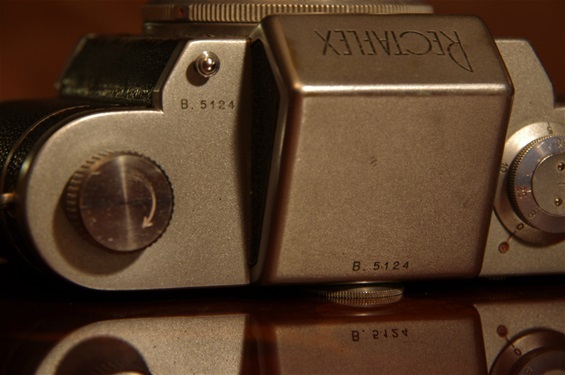 The serial number is B.16xxx on the body, as and prism top. Earlier models had ab N before the number on the house. In this kit: SARIS extension rings and ASVOP hood with patented fingertip aperture control, mounted on the Berthiot 50 lens. 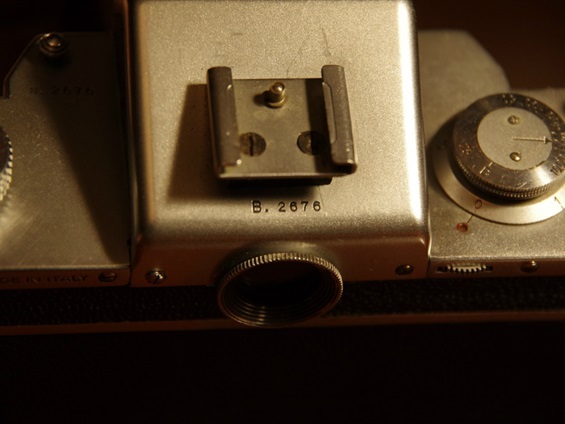 Another B.16000, pictured with the very old and very rare Carl Zeiss 120/4,5 lens. Almost parallel to the production of the B. 16000 series, Telemaco Corsi started the production of a test series that was to lead to the 25000 series with a shutter time of 1/1300 a year later. The 20000 B featured above all a new and improved shutter that, in spite of the 1/1000 mark on the shutter time dial, introduced a faster shutter than the previous ones. This test model was produced between June and December '51 in some 250 pieces only, the first serial number being 20101 and the last one somewhere below 20350. Mine has sn. 20292. Marco Antonetto claims the last sn. to be just over 20300, but I have seen as high as 20332. 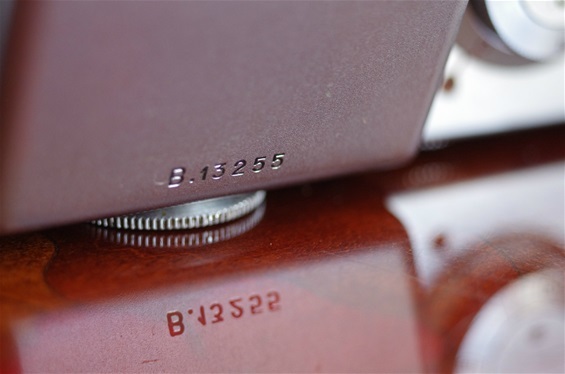 From this series onwards, the serial number was moved from the top plate and prism house to the left top of the back wall, with the letter B following the serial number. The very rare B.20000 series, with only some 250 pieces made, was a test series produced in 1951. Size: 152x89x48mm. Prism house: 18mm. Weight: 658 grams. 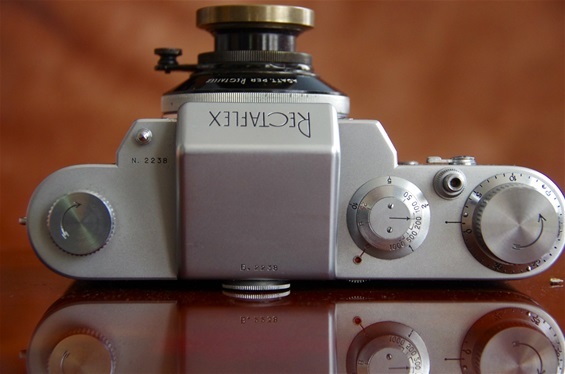 Lens is the Angenieux 28/3,5 Retrofocus. Not often seen: the 20000 series. Mine is 20292 with the B moved from first to last position. Faster than the B.16000 series. Still showing 1/1000. The filmspeed reminder officially came with the B.16000. Though found on some B.4000s, like on mine. 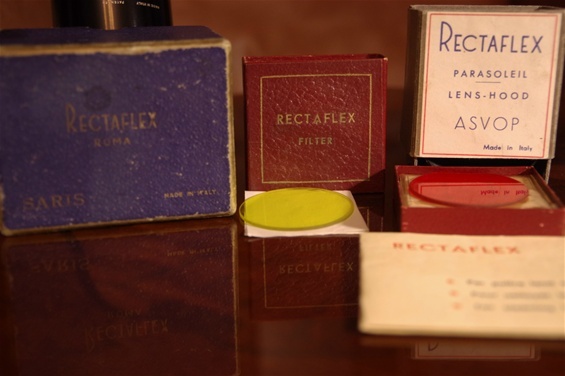 September 1952 was the start of the most productive period in the life of Rectaflex. The camera had undergone several improvements since the start and was finally at it's best, both quality wise and in terms of production. The 25000 series was the biggest series by production, reaching some 4.500 pieces. As this series turned into the next one, the 30000 series at around sn. 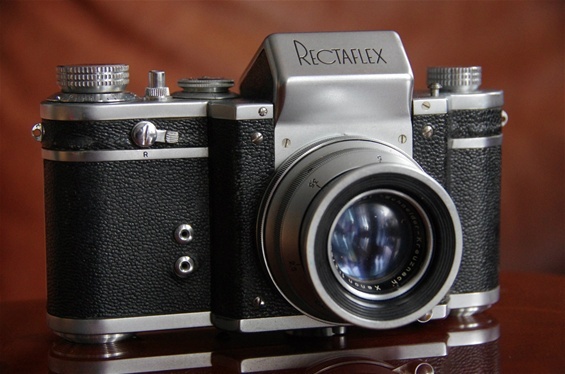 29500, the total production of Rectaflex cameras had been doubled. 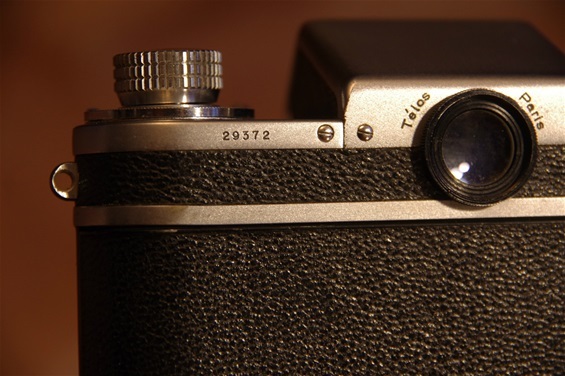 The 25000 series introduced a world's fastest shutter at the time by improving it to 1/1300 of a second. This was based on the work done on the test series 20000 B and marked what some call the second main series, the 1300 series consisting of 25000 and 30000 series. The 25000 series was split in two, the first 550-600 copies with a B after the number, the later without that letter. That was due to the fact that Rectaflex changed to a new supplier of the aluminium alloy body, as they wanted a better quality on the die-casts. However, they still had some old ones in stock, and they were used first. As they soon were finished, the new parts were marked as if it was a new series - for the first time without any letter in the serial number. Shown here is a Rectaflex Standard of 25000 B series. This was the last batch with the old aluminium house, therefore marked with the letter B that had followed all Standard models since the B 2000 series. Sn. 25523 B. Produced late 1952, and one of the very last Rectaflexes with the old house. 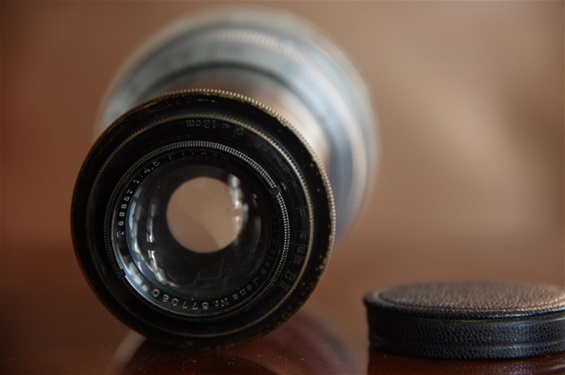 Behind the lens cover is a Schneider Kreuznach 50/2 lens. 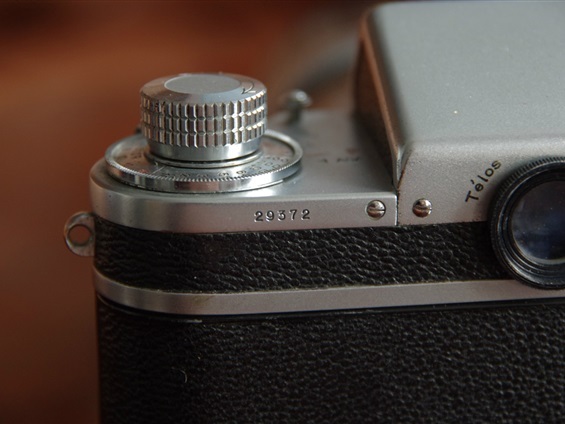 The top of the rewind knob was still of the old type, while the new flash- scale appeared on this late 25000 B copy. The Rectaflex Standard 25000 series with a new die-cast alu house, here sn. 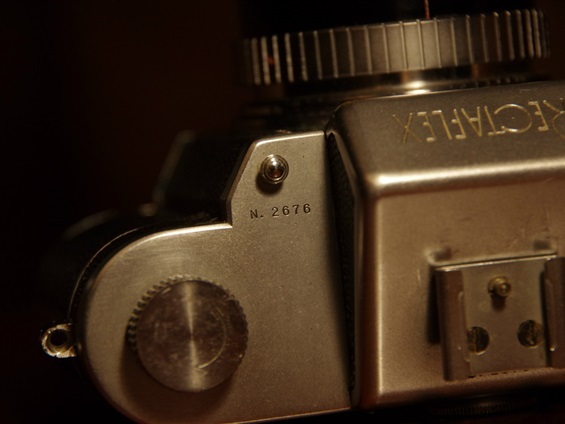 26835 with rare Kilfitt Makro Kilar 40/3,5, sn. 211-4199. The 25000 series went from 25001 B to 29500. This one was exported to the french distributor Télos, perhaps Rectaflexes most active partner. Here is one of the last of this series, sn. 29372. 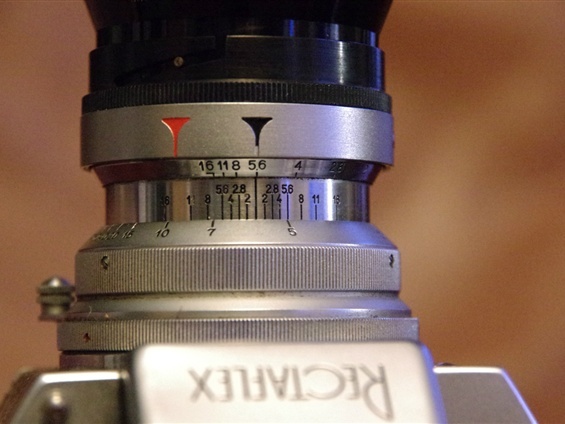 26xxx: still the old design on rewinder and lens release button. 27xxx. As on the 26xxx, except for the extra viewer glass. Probably self made. Late 27xxx had the new design. 28xxx: The new coned top on winder/rewinder, with a rougher satin finish in the centre. 29xxx: As on the 28xxx series. 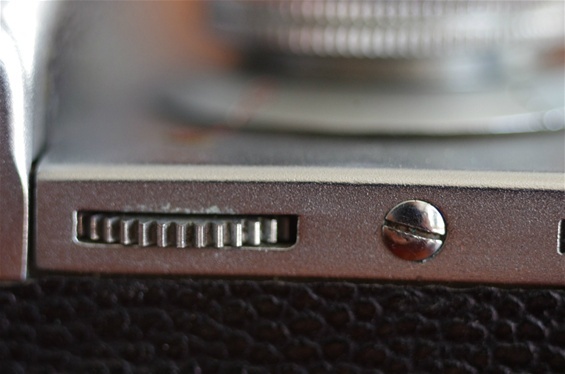 Old style lens removal button. 30xxx: New winder/rewinder design and new mushroom shaped release buttons. 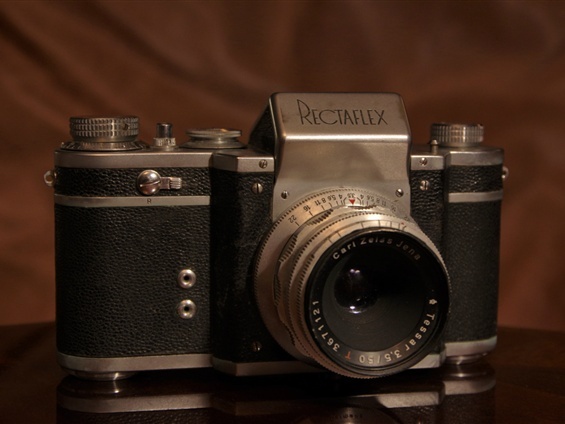 The 30 000 series, produced from January 1954 till the company was sold in 1955, was the best built Rectaflex ever. 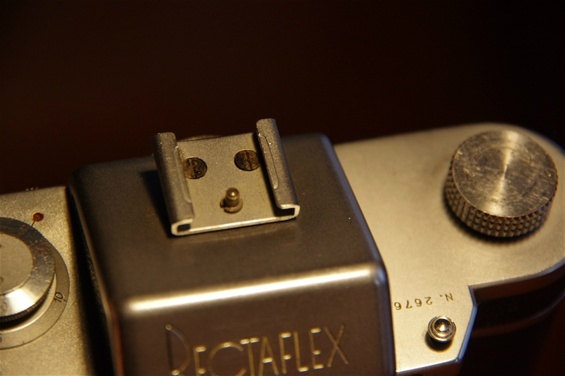 The only visible external difference was the mushroom shape of the shutter release button and the lens release button. But there does not seem to be a distinct serial number introducing this novelty. A sample numbered 29 568 has it, while one numbered 29 680 has the old style. The 30 000 series was the final Italian produced model. Still, after some eight years of technical and productional improvements, the company was not making money. The bank account was empty, and the owners did not want to pour more money into it. The numbering reached some 31 350, with 31332? as the last known sample. The producing unit was sold from CISA Viscosa to a swiss company, Carena, and the production was moved to Vaduz, Lichtenstein. 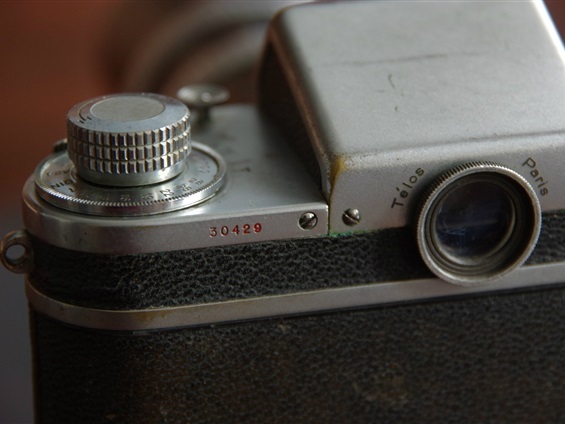 But in spite of trying out a new promising model called the 40 000 series, no more than some hundreds preseries cameras were produced. There were unexpected problems with some light leakage on the cameras, as well as assembling problems. Still, some of the cameras may have been sold. 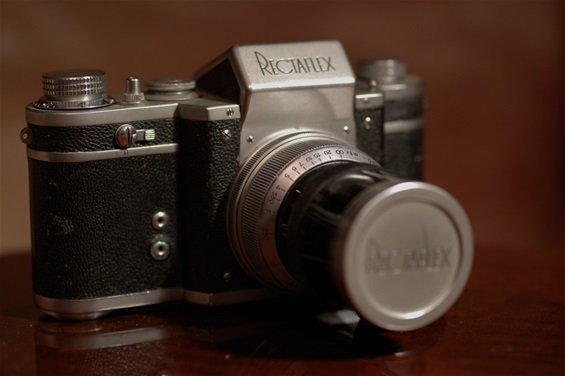 So, the Italian 30000 series was the last production series of the proud Rectaflex - The Magic Reflex - world's first series produced pentaprism slr camera. The last series of Rectaflex Standard, the 30000 series. Here is a sn. 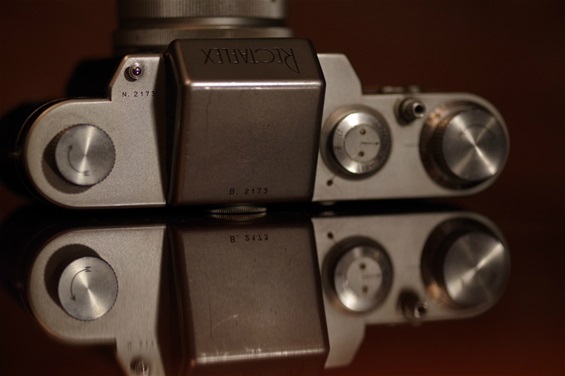 30492 with Angenieux 135/3,5 lens, last version, with sn. 469099. Exported to Telos of France. 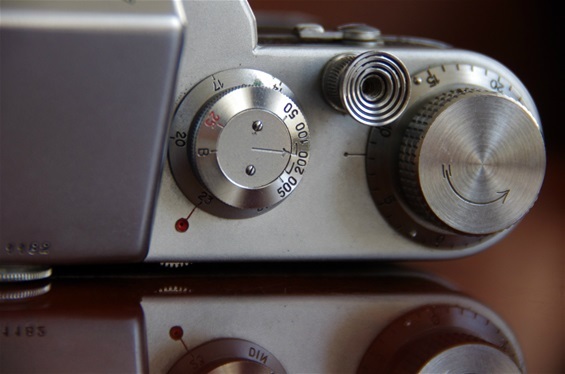 The last design on winder and shutter release button,..
..and on lens release button and rewind knob. A little redesign on the rewind switch. came with 25xxx. Back wall with sn. upper left, made in Italy upper right and US Patent nr. lower right. The countries for export with Rectaflex patent numbers. Among the last Rectaflexes to be sold: the 30000 series with sn. 31265. 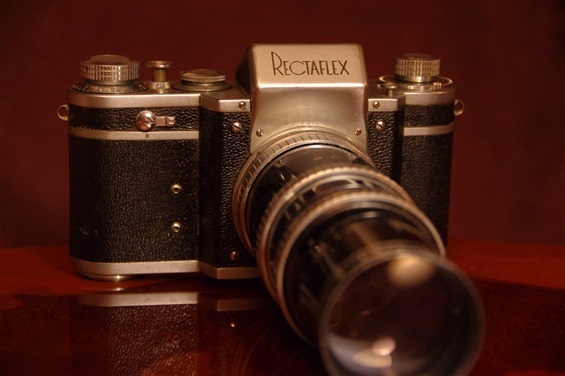 June 1952 saw the introduction of a camera that had hardly been seen before, and that was never to be seen again: the 3-lens turret operated Rectaflec Rotor. It was, of course, heavy, very expensive, as the already high price of the camera would have to be added to three lenses, and big in volume, especially if one added the rifle stock. But it was much faster to operate under various conditions, with the need to change from wide to tele lens or from standard to wide angle, back and forth. Just turn the turret! 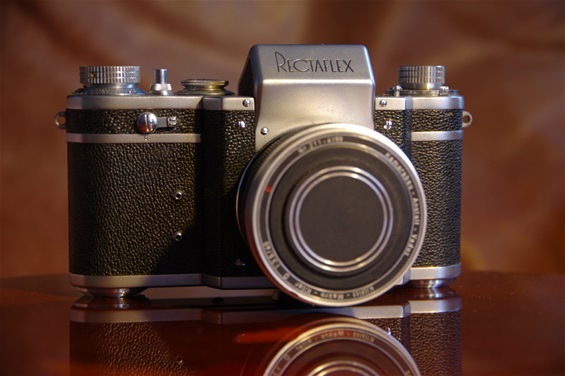 The first samples gathered much interest among photojournalists, and the first series production houses were ready in 1953. Some 50-75 units were built until the company stranded. The Rotor, here with house, turret and the lenses: 35/2,5 Angenieux, 50/2,8 Berthiot and 135/2,8 Steinheil Quinar. This house has sn. 28797. Complete weight of this combo is 3104 grams! 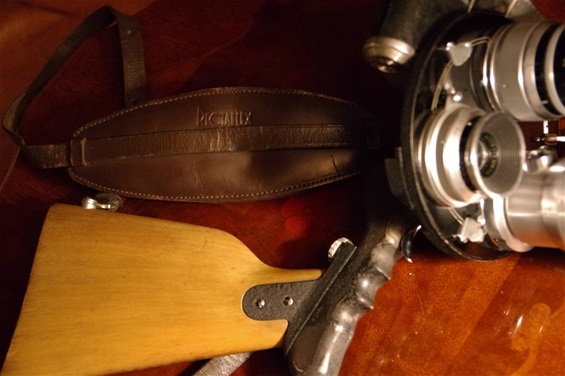 The turret with three lenses, the pistol grip, rifle stock and belt with cushion. All produced by Rectaflex. Note the angle of the rifle stock where it hits the pistol grip. The trigger on the pistol grip was connected to the shutter release button on the camera through a rod. It was stuck upon arrival, but some lube and some care always make wonders. The impressive Rotor. A rather worn prism house, though. back of turret with manual transmission from trigger to release button. Note the blinded lens release button, as each lens mouth on the turret had its own. Some rather worn parts. The inside looks surprisingly good. The Gold series was a very limited one, given to leaders like Pope Pious XII, King Farouk of Egypt, general Dwight D. Eisenhower of the USA, Winston Churchill of Great Brittain, Italian President Luigi Einaudi and the president of Viscosa, the owner of Rectaflex, Francesco Maria Oddasso. There was also one that was placed on display in the reception hall of the company. That means seven altogether. That we know of. There is, however, another golden lens fitted on a non-gold plated house, the ultra rare B. 5122. So, lenses for more than those seven cameras may have been prepared. I might, of course, change the colour of the background here, and pretend the camera is a part of my collection. But no, it is not. But the lens is!! Se the B.5122 and under lenses. 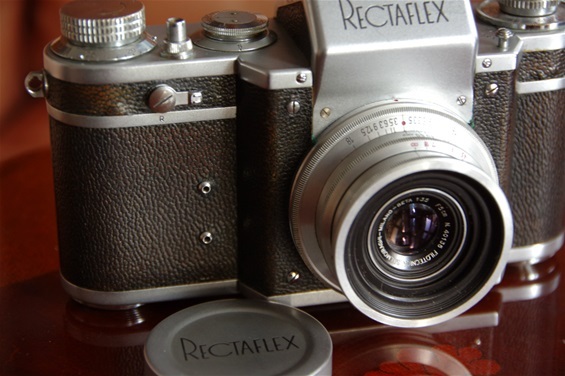 As Rectaflex did not produce lenses, they were depending on the cooperation of other companies to be able to deliver complete cameras. But that was certainly no worry; lens producers from many countries soon queued up to deliver high class lenses. They were: Pierre Angenieux Paris, S.O.M. Berthiot, Boyer, H. Rousel Paris and OPL (Foca) of France, Old Delft of Holland, Schneider Kreuznach, Voigtländer, Rodenstock, Kilfitt, Steinheil, Leitz and Schacht of West-Germany, Carl Zeiss Jena of East-Germany, Elgeet Optical of USA and, from Italy itself, Officine Galileo and Filotecnica Salmoiraghi Milano. 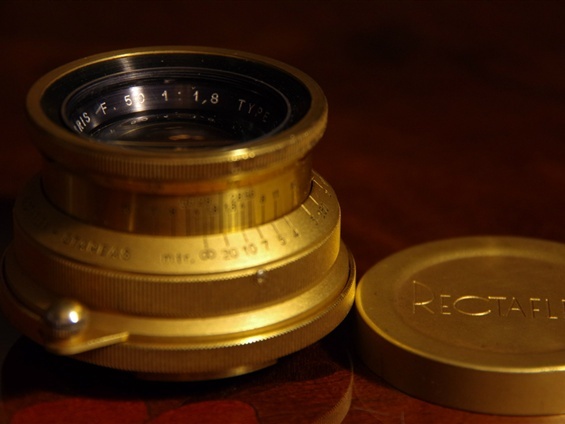 In addition, the Kilfitt lenses, or some of them, were produced on permission in Lichtenstein by Kamarabau Anstalt AG. 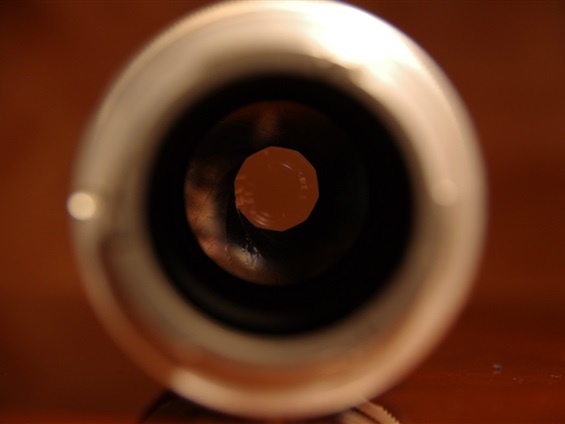 And, although not mentioned in Rectaflex literature, there is an english Dallmeyer lens around. It might be a sole sample and therefore a special build. But if Dallmeyer had some regular production for Rectaflex, this brings the numbers even higher. So, at least 17 companies from at least 7 countries were involved in lens making. But of these companies, Angenieux and Schneider were by far the most common. 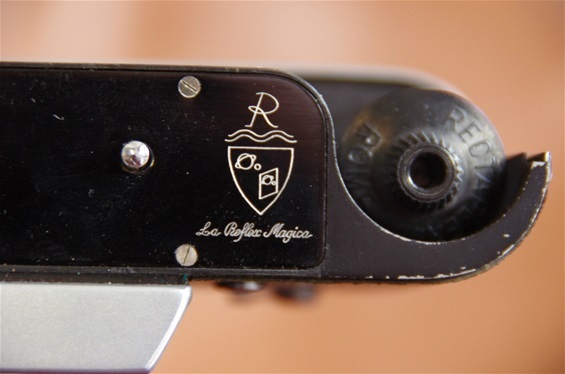 Of the french, I have yet to see a single lens from Boyer, Rousel or OPL. And the same goes for Old Delft and Elgeet. 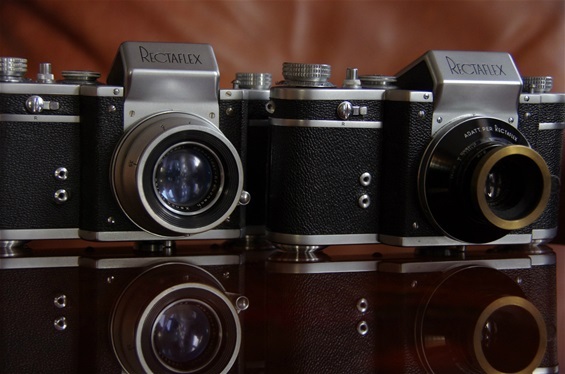 They are all on different Rectaflex lists over available lenses, but may have contributed with only a few, or even none. 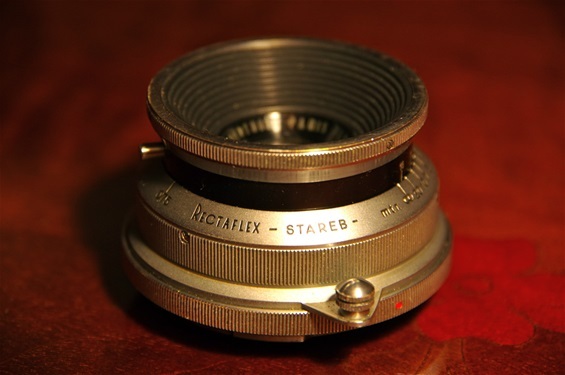 As all parts in the Rectaflex system had code names, the standard lenses up to B.16000 series were named STA for Standard, RE for Rectaflex and then a letter for each producer, like A(S) for Angenieux, B for Berthiot and X for the Schneider Kreuznach Xenon. 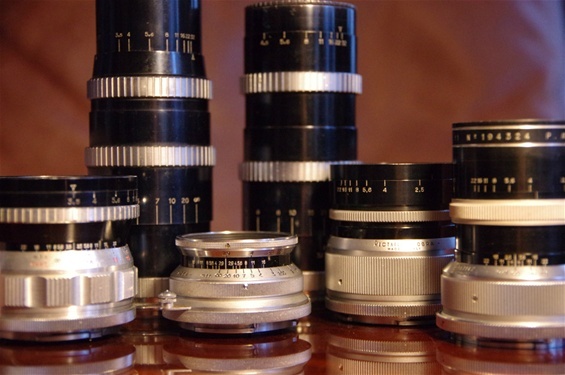 Among the standard lenses, some 3000 Angenieux 50/1,8 were ordered, some 2000 Angenieux 50/2,9 and some 2000 Schneider Kreuznach Xenon. After having studied the lenses offered for sale the last years, these numbers seem to be very well reflected on the market. P.Angenieux Paris delivered the most lenses to Rectaflex, in total numbers and in variety. From the left: 28mm, 135mm, 50mm, 180mm, 35mm and 90mm. 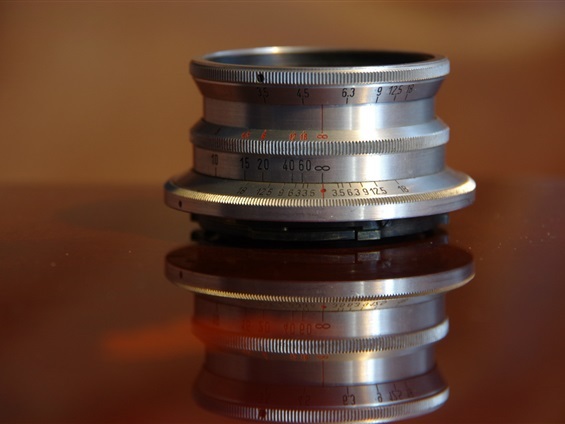 Wide Angle lenses were produced by P. Angenieux and SOM Berthiot, covering 28 and 35 mm. 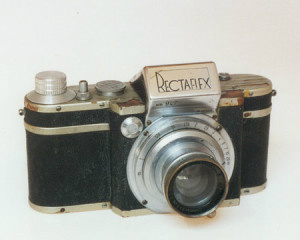 Berthiot delivered from 1949, but only a 28 mm with an external viewfinder as the mirror had to be lifted to allow the rear of the lens to enter the camera. 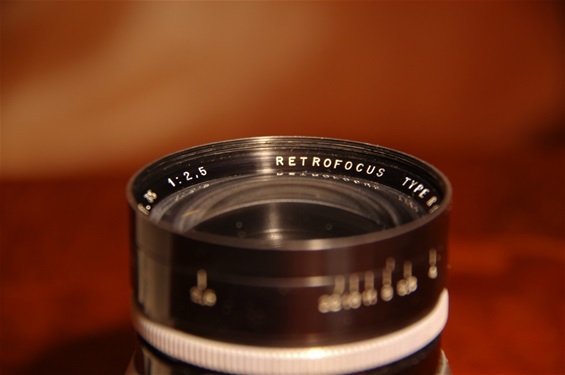 From the time Angenieux introduced their Retrofocus lenses, they were dominant. 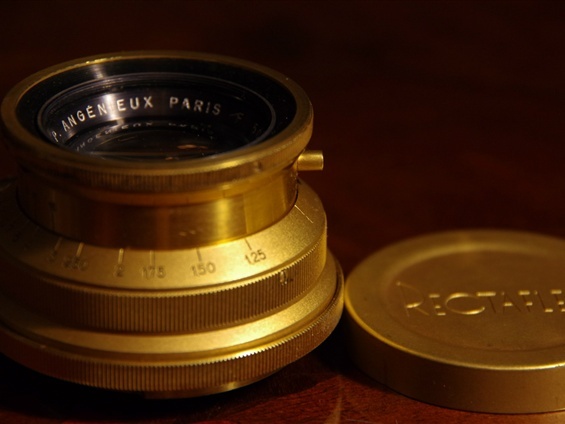 The Pierre Angenieux Paris 35/2,5 Retrofocus was worlds first functioning wide angle lens for slrs. 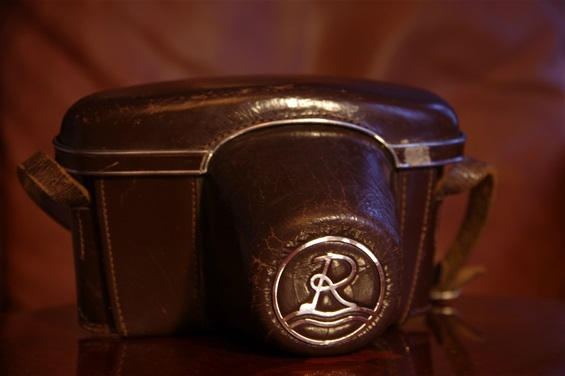 There had been lenses like the 35 Berthiot before, but they were designed for rangefinders were one had no mirror to take into consideration. This one is the second version from early 1950. 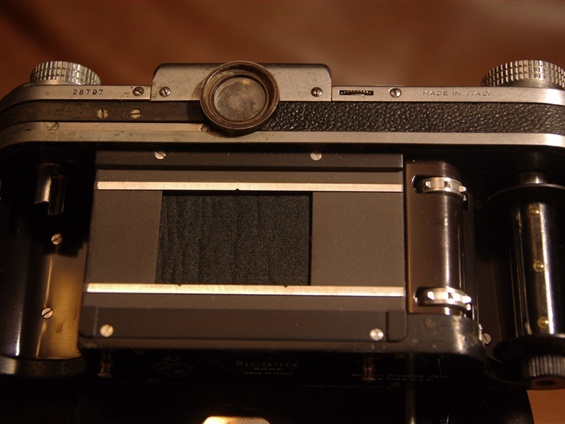 The Angenieux Retrofocus construction made wide angles fully operational on an slr. Here sn. 181428. 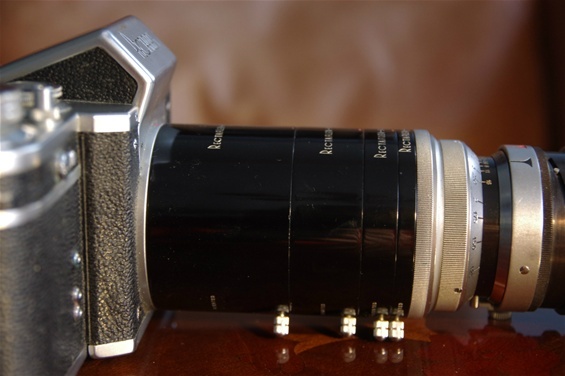 The first version of three of the Angenieux Retrofocus 28/3,5 introduced in 1953. Sn. 365854. 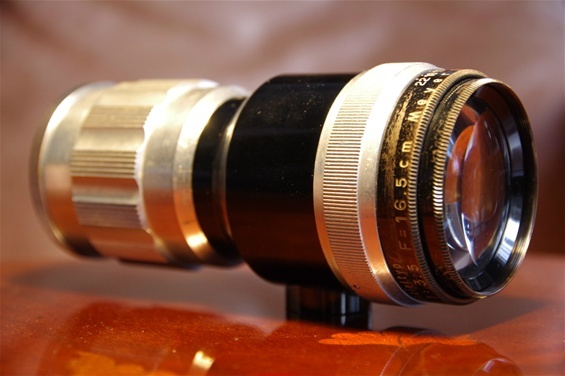 The design of the Angenieux lenses were changed over the years. Here is a first edition with most silver and less black. 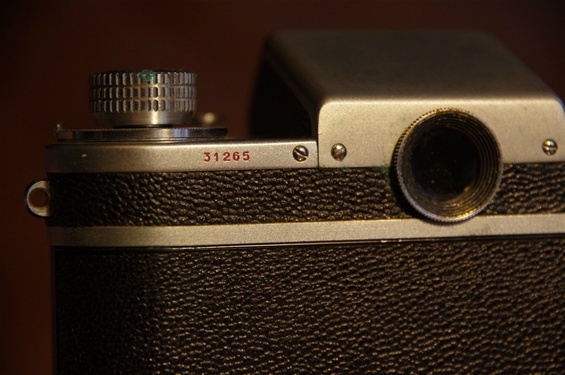 Next edition was almost identical, but differed by some black on the aperture ring. Last version was differently shaped, and with more black. 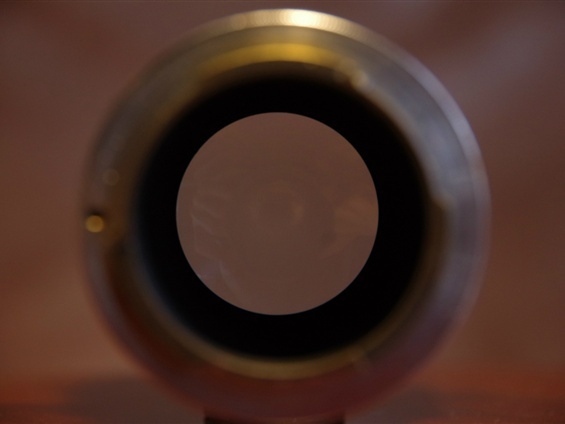 Most of the 17 producers of lenses for Rectaflex delivered normal lenses. 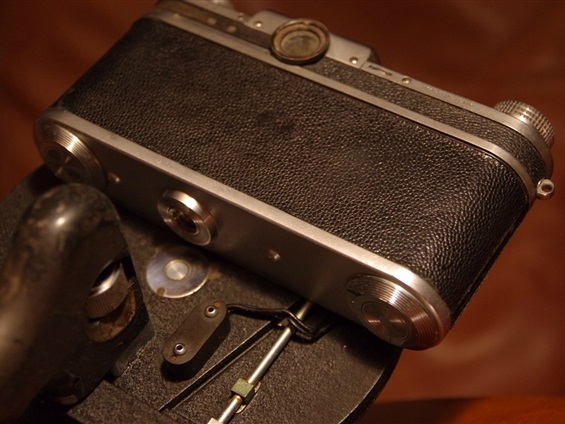 But the most common ones were Angenieux with either 50/2,9 or 50/1,8, and Schneider Kreuznach 50/2. Angenieux were delivered from start till finish, the Xenon from B.2000. 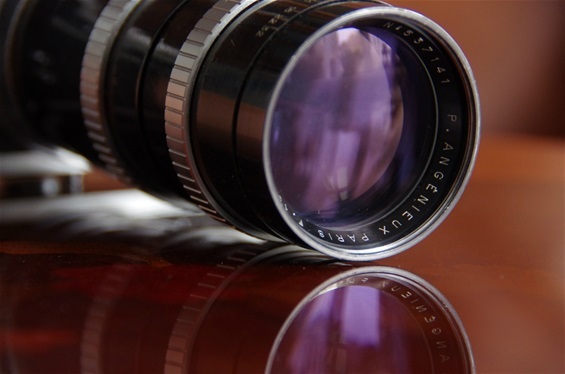 These lenses make up for some 70% of normal lenses to follow the cameras. 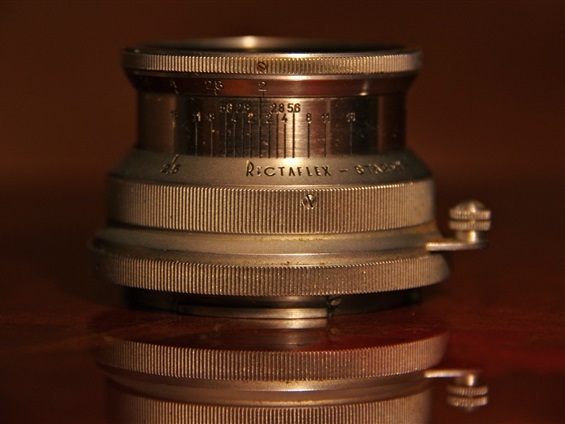 One of the most common lenses to be seen with Rectaflex cameras, the Pierre Angenieux Paris 50/2,9. Still very valuable today. Delivered from A.1000 through 30000 series, though in different designs. Presented here is one from the first design, dated 1948. Sn. 149456. Code name STAREA, but not engraved on this sample. Angenieux 50/2,9 compressed for infinity focus. And extended for close up. 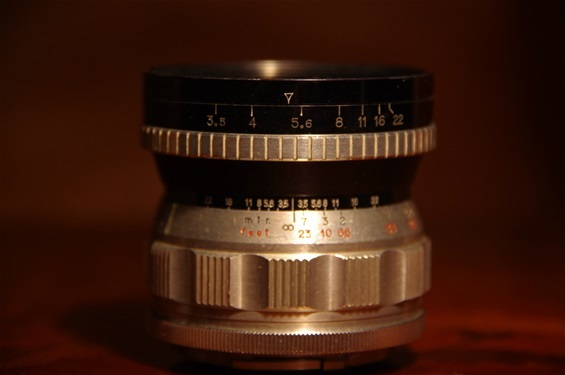 The very common (among the rare) normal lens Schneider Kreuznach Xenon 50/2 lens. (STAREX). Delivered from the B.2000 through the 30000 series. Sn. 2145881. 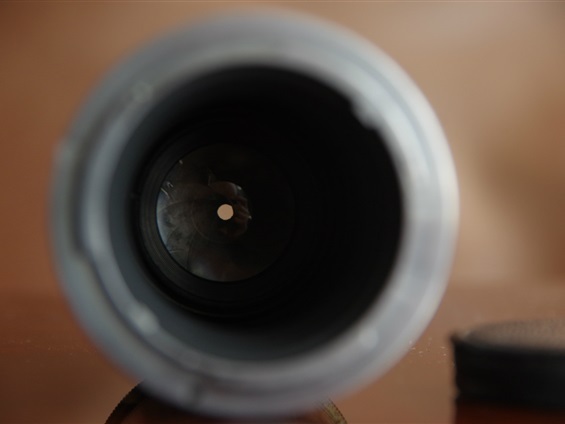 Of all Rectaflex mount normal lenses sold on ebay lately, this lens is by far the most common. 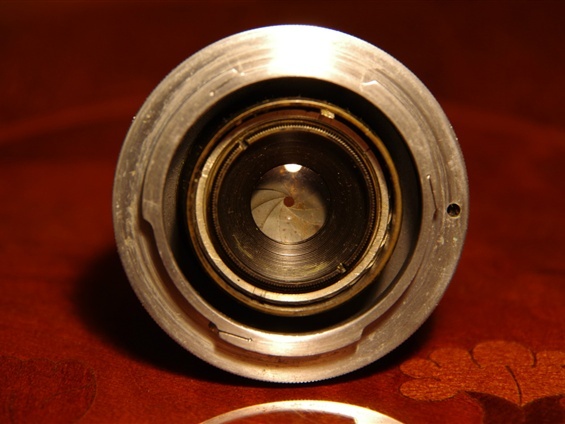 The french SOM Berthiot 50/2,8 (STAREB) lens was delivered from the A.1000 to the 30000 series, the same design was kept all the way. Sn. 822250. Not the most expensive at the time, but highly sought after now. 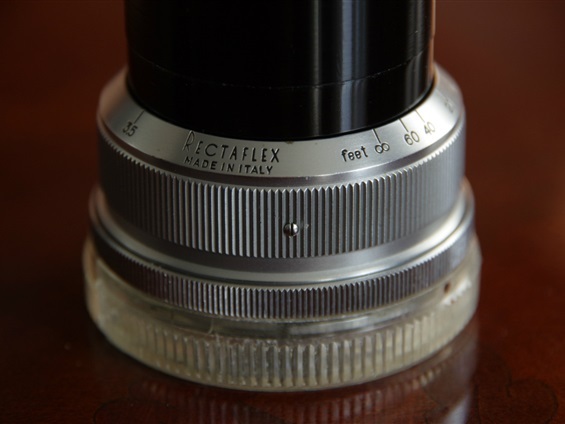 Italian producer Filotecnica Salmoiraghi Milano produced this Beta 50/3,5 lens for Rectaflex. More or less common from early 50s. The little lens with the long name: Filotecnica Salmoiraghi Milano Beta 50/3,5. The first edition had no Salmoiraghi in the name. 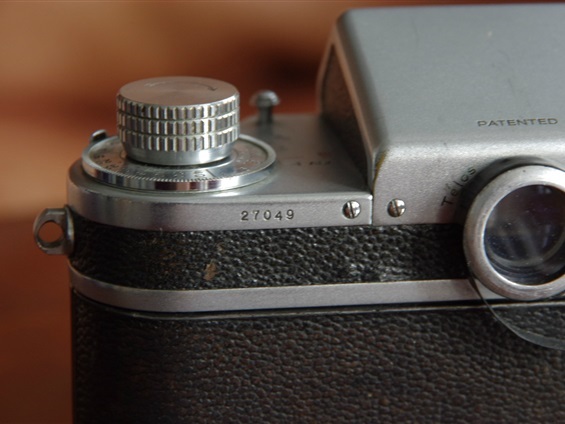 It was introduced in 1950 and had the early triangular focusing lever. This second edition came in 1953 and followed the Rectaflexes till the last production in '55. 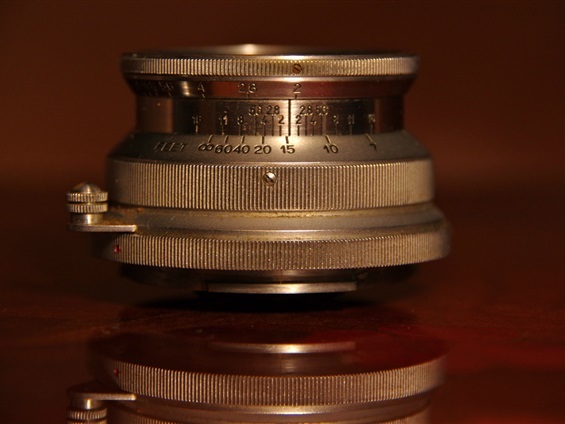 It was built like a Tessar, a much copied lens. Simple, but very good. Sn. 40135. 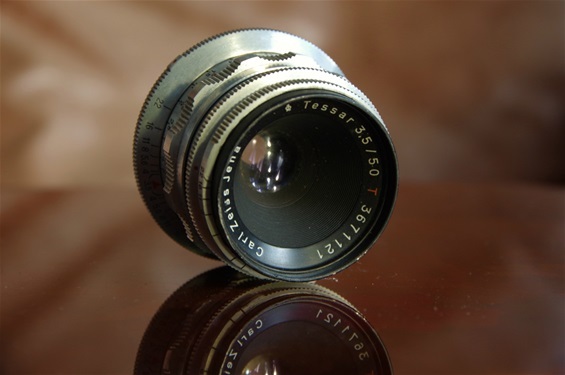 The Carl Zeiss Jena Tessar 50/3,5 is not in any price list, but must have been a special adaption on special order. It has a very old style. 30s? 20s? See more pictures under Rectaflex 2000 series. Sn. 473934. NB! When conferring a list of serial numbers versus year of production, it becomes clear that this lens is produced second half of 1922! Originally a very small lens, but here built into an adapter to fit the Rectaflex mount. 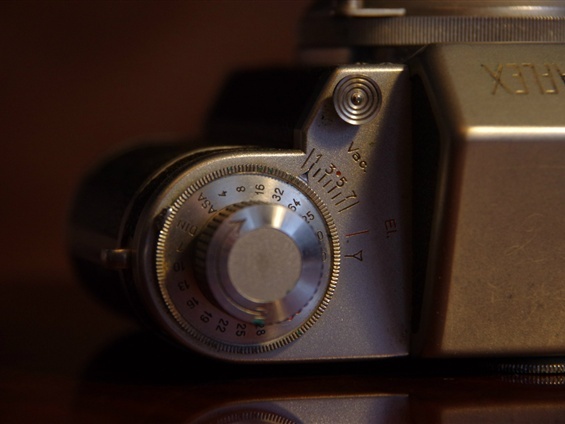 This Carl Zeiss Tessar 50/3,5 was developed from the older lens. It was presented on Rectaflex pricelists from 1952, but was available from 1953-1955. Seen on some B.16000 cameras, but mostly came with the 25000 and 30000 series. 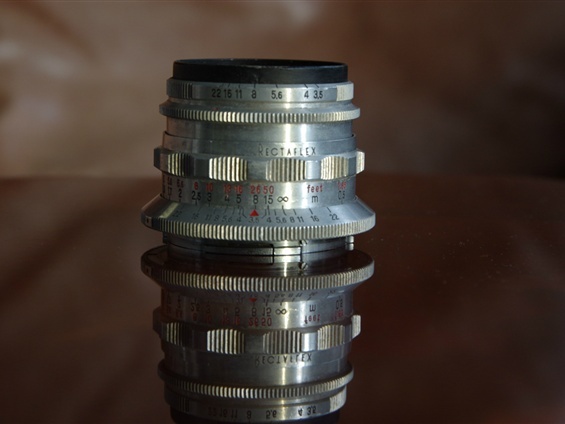 This lens was probably produced in 1953, according to Carl Zeiss Jena production lists. This was a compact glass construction, four elements in 3 groups. Theere was no sunshade for this lens, as the deep body constriction provided the same effect. 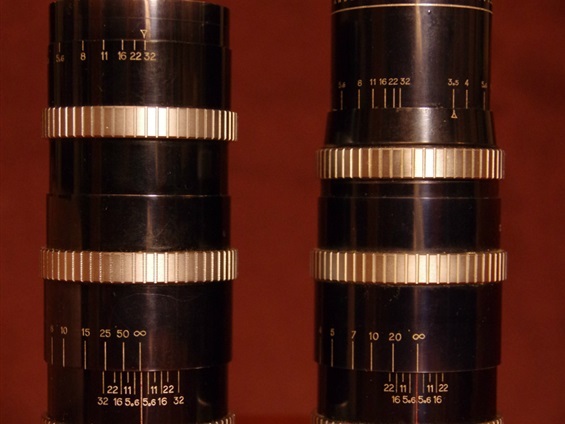 While only Angenieux made usable wide angles, there were quite a few standard lenses to chose from. 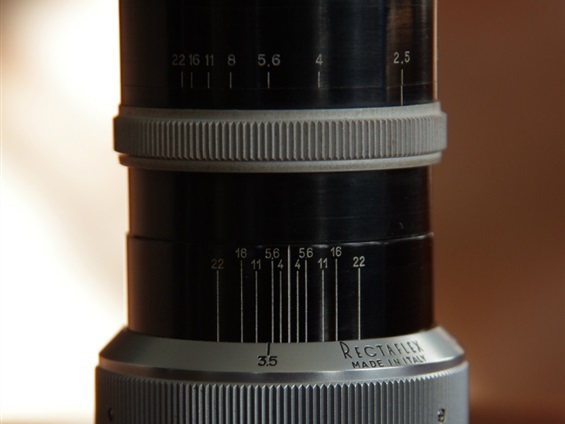 When talking tele lenses there were many, from 75 to 600 mm. Again, Angenieux delivered some, from 90 to 180mm. 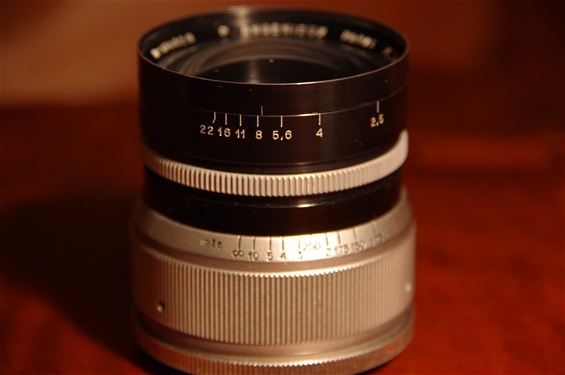 (There was also a 75 mm in one pricelist, but that lens was never produced.) 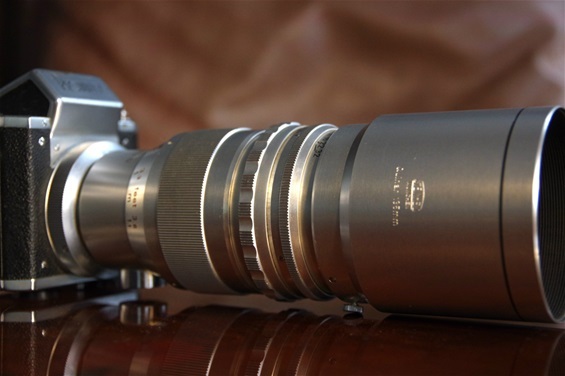 Carl Zeiss delivered from 75 up to 300 mm. From there and up only Kilfitt of Munich would deliver. Others were Boyer with Saphir 100/1,9 and SOM Berthiot from 135 to 180mm. From Scacht Ulm there were at least a 135/3,5, from Steinheil München a 135/2,8, and from Meyer Görlitz a 165/3,5. The P. Angenieux Paris 90/2,5 was a marvelous lens for portraits.There was also a 90 mm 1,8. This sample is the second version, produced from 1950 till '53. Only cosmetic differences from the first and later versions. Sn. 194324. 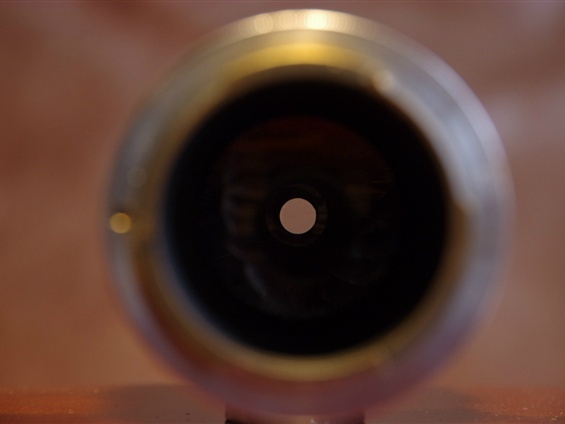 The special shape of the aperture blades forms the perfect round opening for portraits. Compressed for infinity. Length: 74 mm. Extended for close up at 1 m. Length: 83 mm. 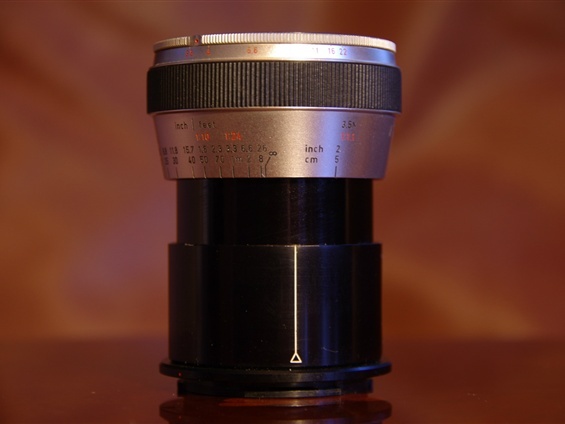 This is very rare Carl Zeiss Jena Tessar 12cm/4,5. 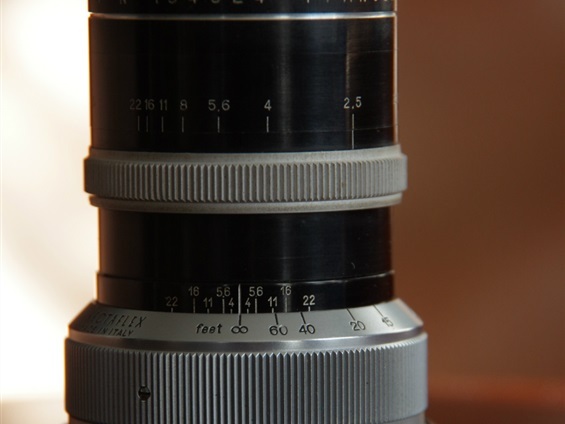 As with the CZJ 50/3,5 shown under normal lenses, this lens was never in any Rectaflex pricelist. The sn., 377060, tells us it was produced early 1920! The old design tells us that this is a special order, probably delivered by a customer to be mounted at the Rectaflex factory. 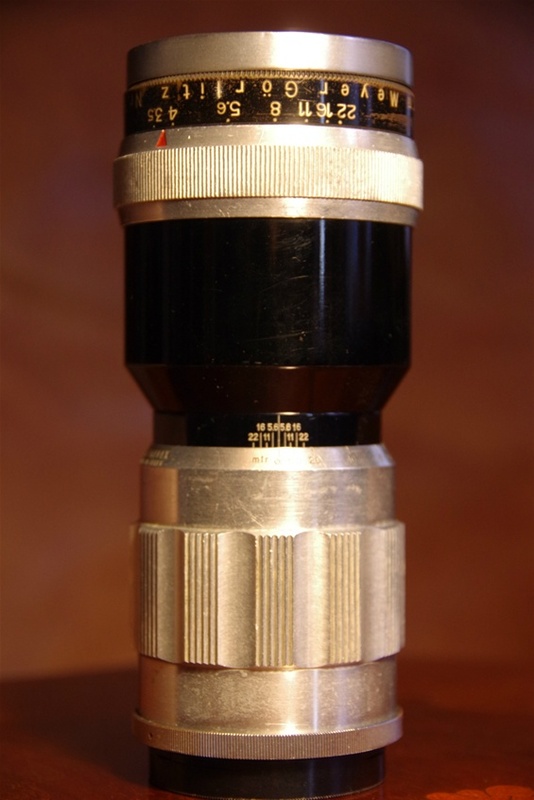 The Tessar was a popular construction, produced first in 1902, consisting of 4 glasses in 3 groups. Later copied by most other lens makers for many years. 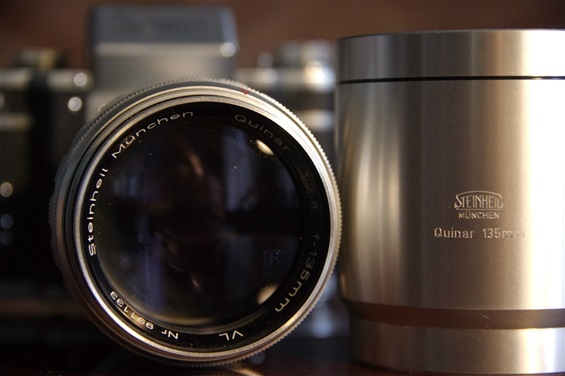 The diaphragm closed to a 32 opening..
A fantastic piece of glass - the Steinheil Quinar 135/2,8. As if it was taken right out of the box. Sn. 991133. The Steinheil Munchen 135/2,8 with hood. Beautiful - smooth - sharp. 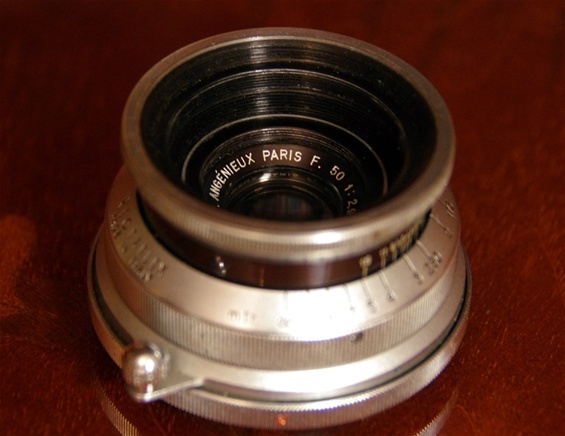 The Pierre Angenieux paris 135/3,5 tele lens, shown here in the last version from 1953. Sn. 469099. 180/4,5 to the left, 135/3,5 to the right, 1 cm longer! Filter size: 49 on 180, 44 on 135. 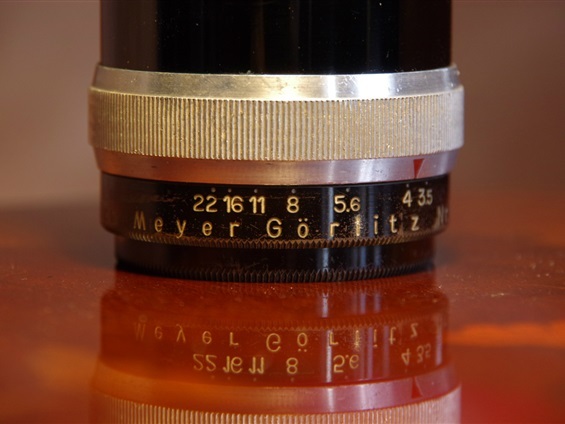 A very rare Meyer Görlitz Primotar 165/3,5 tele lens. This is not mentioned in Rectaflex literature, so it is probably a special customer order. Note the tripod adapter under the front of the lens, as the glass elements were all placed there. Length: 148 mm, weight: 829 grams. Sn. 688152. 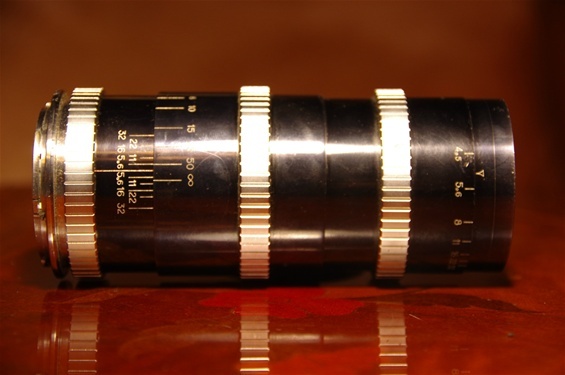 The Pierre Angenieux Paris 180/4,5 long tele lens. 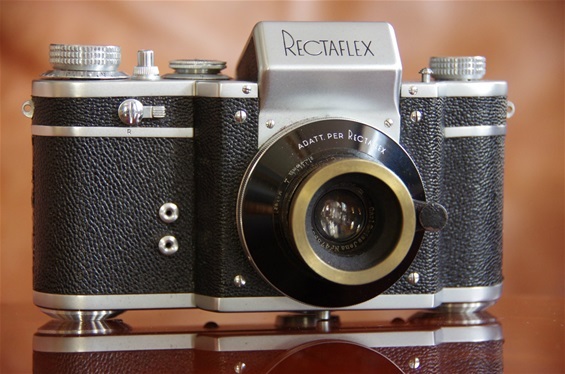 This is the last version with the late design, delivered from 1955, just as Rectaflex had stopped production. Sn. 537141. 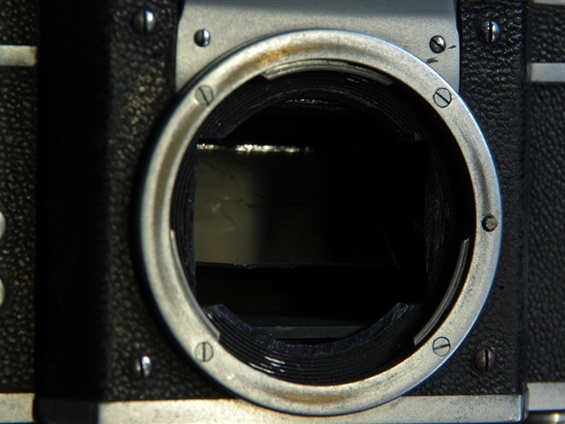 Elder Angenieux lenses often had a very soft coating which in some cases has led to cracks on the front glass. This one is clean. A beautifully rounded opening, giving nice bouquet. 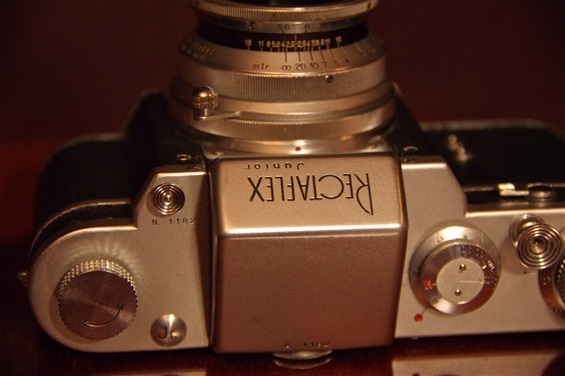 Heinz Kilfitt invented worlds first macro lens for 35mm format, released in 1955 as Kilfitt Makro Kilar 40/3,5. Mounts were made especially for the brands that did not produce lenses themselves, mostly Exacta, but also for Alpa and Rectaflex. 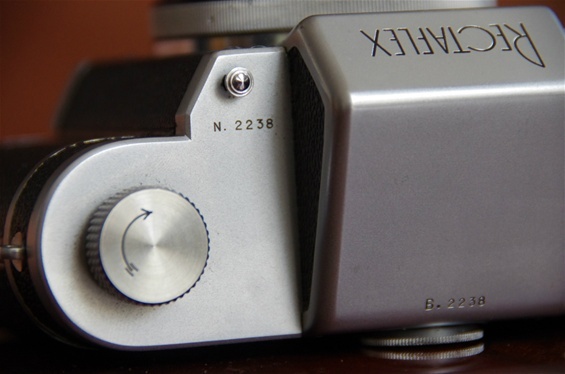 And for the Praktica/Contax/Pentax M42 mount. 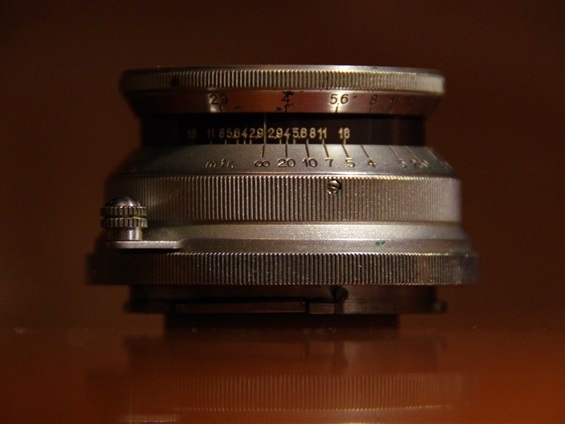 The rather rare and probably worlds first macro lens, the Heinz Kilfitt München Makro Kilar 40/3,5. Sn. 211-4199. 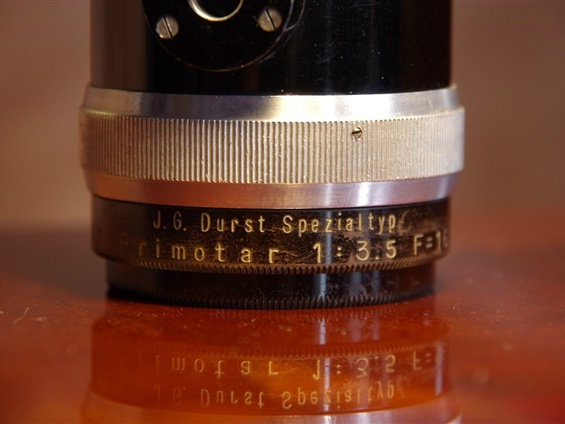 Note that Kilfitt built some lenses at the Kamerabau-Anstalt-Vaduz in Lichtenstein. Also note that when Rectaflex was sold in 1955 and moved abroad, it was the same Kamerabau-Anstalt-Vaduz that was to carry on! 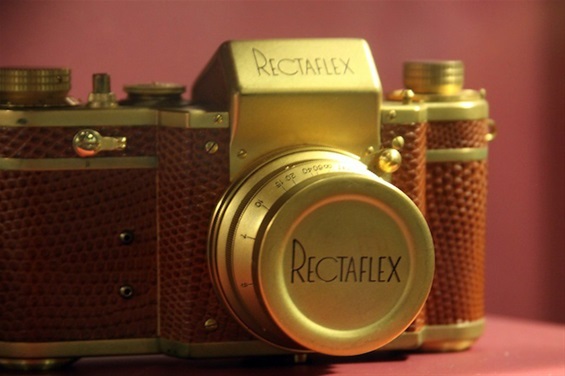 Rectaflex aimed at being a system camera, producing all kind of extra equipment for the photographer. 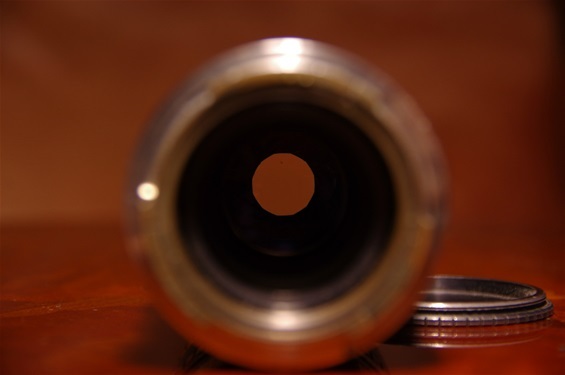 Bellows, extension tubes and rings, filters, special lens hoods, adapters for microscopes and more. Here is the patented Rectaflex lens hood ASVOP. 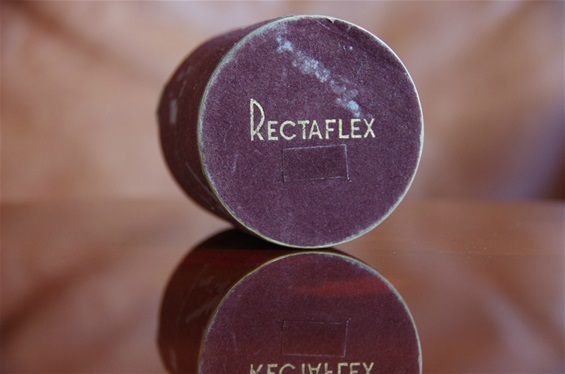 As the diameter varied on different lenses, Rectaflex produced several lens hoods with different names. (ASOP, ASRAP and more.) How to use? 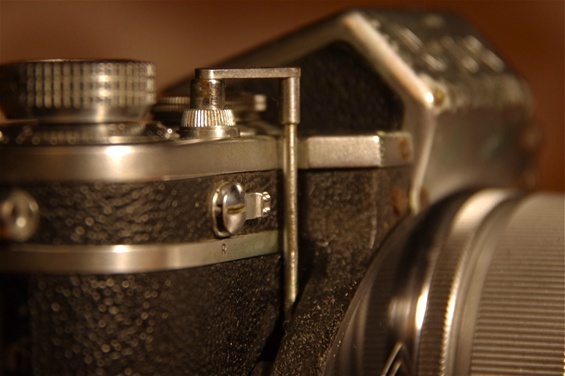 See below..
Fasten the lens hood around the outer ring of the lens with the black arrow pointing at the chosen f-stop. Turn the hood with your fingertip until it stops at full opening. Focus. Turn the hood back again til it stops at chosen f-stop. Fire! 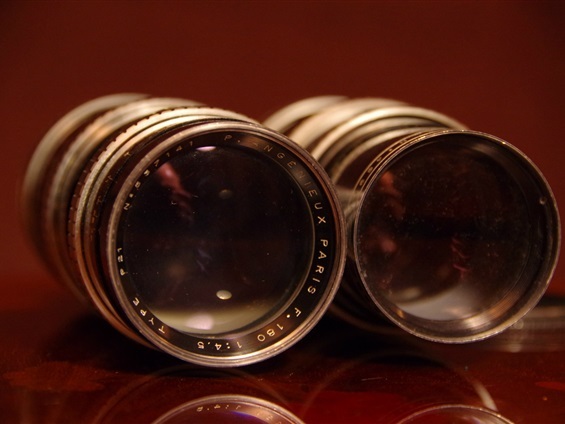 Original boxes for SARIS extension tube set, for Rectaflex filters and for ASVOP lens hood. And even some Rectaflex lens papers. The extension tube set SARIS. Also mounted with ASVOP lens hood on Berthiot lens. 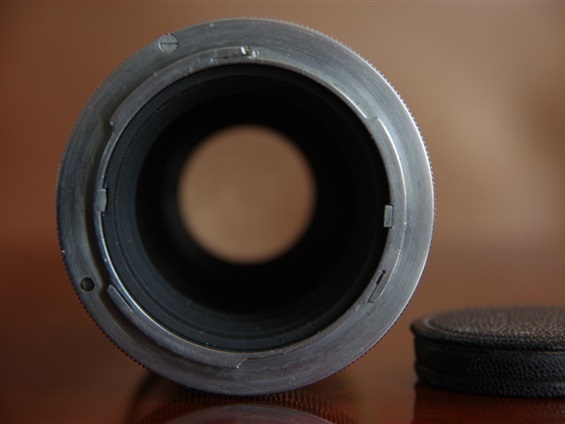 Original cases for camera, ASVOP hood and SARIS extension tubes. 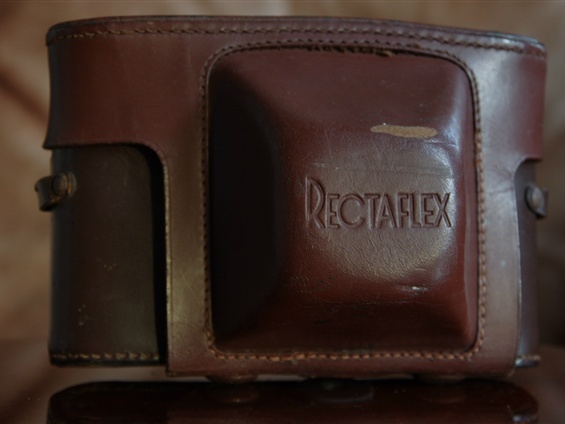 There were at least 6 different cases for Rectaflex, depending on the model and the lens to follow. This one followed the 25000 and 30000- series, and could take a medium tele lens. This case was originally produced to follow the B.3000 series, but is seen with most other later series. Together with the 25000 series case, this was probably the most used ones. 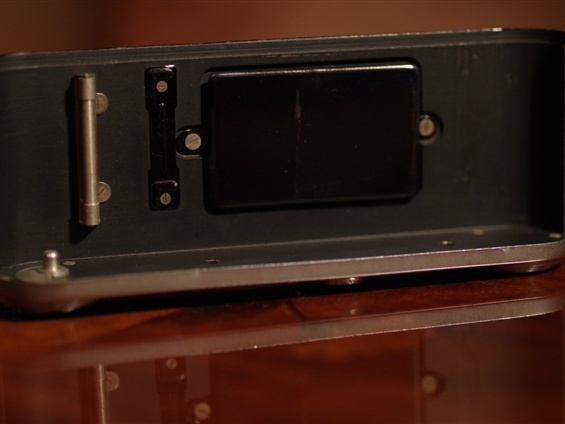 Please note that any of the elder cases could be sold with newer cameras due to the fact that the size of the camera house was almost unchanged from the 100-series to the 30 000-series. Pictures from the factory in the very early 50s. Almost all information presented about the history of Rectaflex is based on Marco Antonettos fantastic book: "Rectaflex - the Magic Reflex" . Nassa Watch Gallery 2002. Founder of Rectaflex SpA, Telemaco Corsi during work. 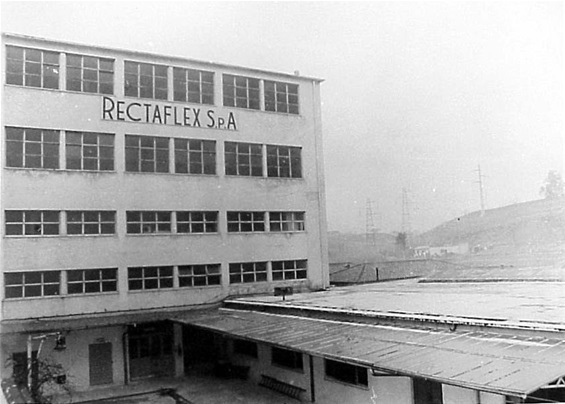 Rectaflex SpA factory, via Monte delle Capre 23, district of Trullo, Rome, Italy. 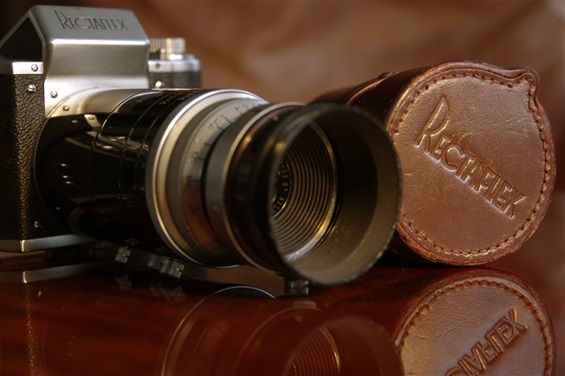 The structure and economy of the company was not as good as the cameras, and they had to end their production in '55, then taken over by a swiss company that moved the production to Vaduz, Lichtenstein. Some 200 prototypes of a new 40000 series were produced there, but no new series production took part until the game was finally over in 1958. 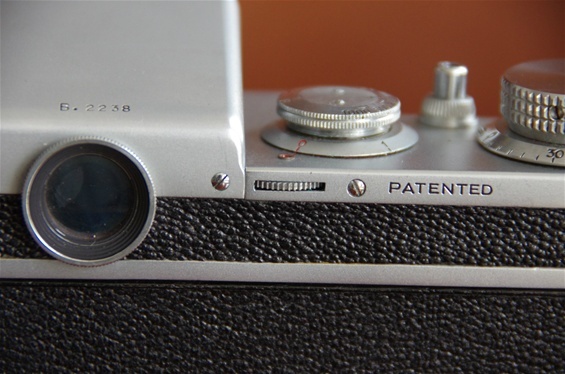 During this period, in 1957, some cameras were also produced in the lab in Roma. They were not under Lichtenstein control and were to be sent to the french distributor, had they ever reached series production. 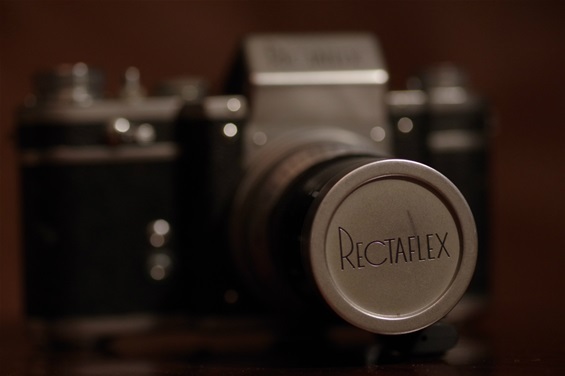 I have given the Rectaflex story a time frame between 1948-1955 as it marks the start and the end of series production. The following is an article, dropped on facebook!, based on the very detailed book: Rectaflex - The Magic Reflex, by Marco Antonetto of 2002. Its a google translate, with all the fun it brings: you can read about prices like 65.000 pounds when the author speaks lire. And it says "car" when "macchina", camera, is the word. The founder, Telemaco Corsi, is sometimes called course or Courses. And so on. 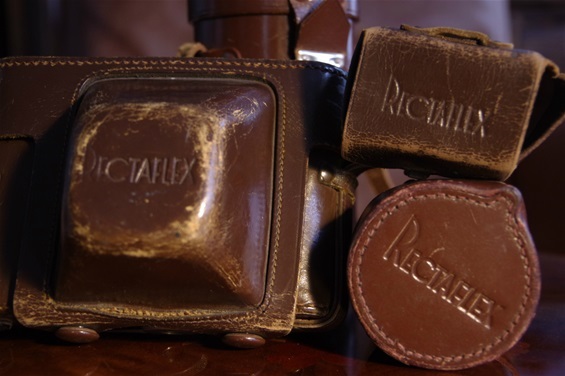 But it gives some very interesting details about the development of the Rectaflex in 1948. 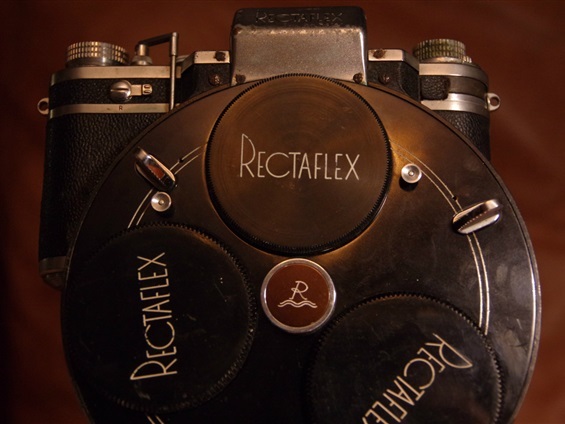 At the Milan Fair in May 1948 finally appears Rectaflex the Standard Model 47 fully functional. Courses needs to take a lot of orders to support the program Rectaflex, and finally convince the Board of Directors of the CISA Viscose to allocate the money necessary for the transformation of plant SARA and for the recruitment of qualified personnel. The machine is equipped with the prism of Rectaflex monolithic sloping roof for proper vision right-left; has the tagliapellicola and still does not provide the rewinding of the film. The mirror is free from vibration, and is almost instantaneous return as it is pushed by springs but accompanied by the lever of the shutter button and falls with the release of the button. The mechanism of this is slow and it is very similar to the delay with lever escapement mounted on rubies. In Stand Rectaflex is also exposed a machine immersed in a glass bowl full of water, demonstrating the strength of the materials that compose it. At the booth Rectaflex there is a beautiful small eight-page, where it appears for the first time the slogan Rectaflex, the SLR magic and logo with Saturn. On the occasion of the 26th Fiera di Milano also appears in the first price list information, which is marked in May 1948. The camera body is called STARE and costs Pounds 65,000. The book can be with different optics: Angenieux 75, 90 and 135 mm; Berthiot 135, 145 and 180 mm and the resplendent Boyer 1:1.9 / 100 mm. 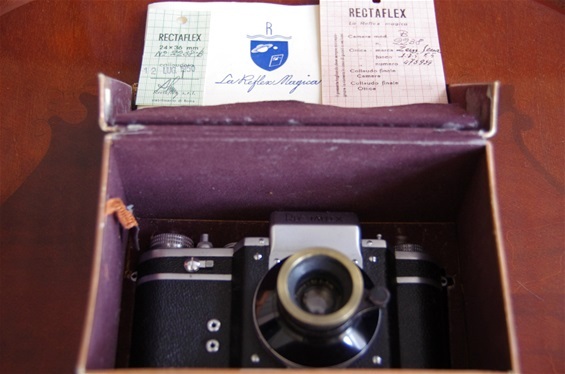 Undeniably, for his Rectaflex, Courses wanted the objectives of the Leitz Wetzlar but the house would never have granted its optics, such as Ferrari does not grant its engines to opposing teams: the Rectaflex is a real competitor, which overlooks the market with an even more attractive of the small Leica.The accessories that enrich the kit include: Leather Case Ready (5,000 pounds), the color filters in boxes of 10 (45,000 pounds) and others. The Pavilion Photography Optics-counts, alone, over seventy exhibitors. Among the most visited areas we are willing to stand quadrilateral Ducati, that of Ferrania, the Cattaneo (Rollei and Leitz) and Meccanoptica (Zeiss-Jena). Among the exhibitors there are Fototecnica of Turin (Herman with the 24x36 Rangefinder and Bandi, box 6x9, from the front and the colored box integrated in the body); Ferrania (with Condor and Falcon) Ducati (the Dream); Boniforti and Ballerio (Perseus with the 24x34), the Kristall (with Lux ISO). The Gamma Officine Precision exposes the Gamma II and III with Bayonet Lens Mount and optical Angenieux. Finally, the stand of the Filotecnica-Salmoiraghi seems that there has been, placed under the counter, a 24x36 with reflex viewing prism. Her you will not have as a result of news. A miracle from Rome ... Progress in the photo appears in a large service in May, written by journalist George Balabani, who, with typical style of the 40s illustrates and enhances the product. The service is called The Miracle Rectaflex, subtitled "The miracle from Rome. We propose a few excerpts. 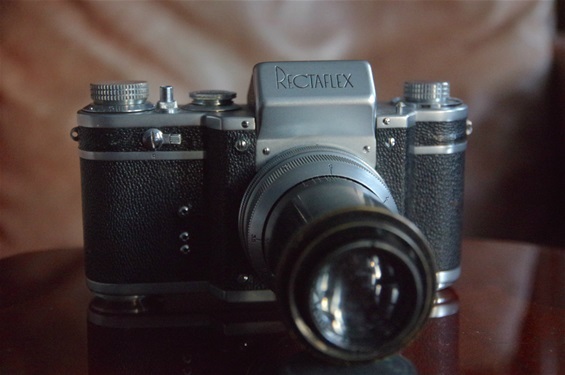 As the Commissioners of the Pavilion Photography Optics-we received many congratulations for not having exaggerated exaltation of the new standard, which makes Rectaflex's car today and tomorrow, the aristocratic class of its own. 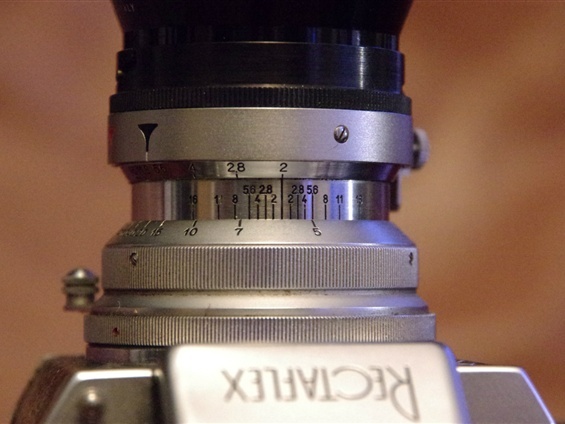 This is a reflex at eye level, with focus on frosted glass to zoom in, checked to come from a brilliant range finder, which can not know because faults incorporated into the prism receiving the image. Also working vertically, that is, when the unit is upside down, the image is always upright, with the right that is to the right, left what is left. The characters will be read normally. There you come and say that this particular relative interest, since in the frame is good to see things as they really are: both in groups and in the composition of still lifes or other sports scenes in particular, since it is easier to follow a car in its true direction in reverse ... 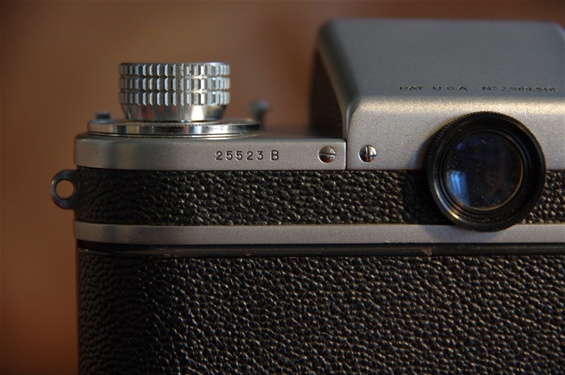 The new rangefinder that works integral with the prism, and is called stigmometro (from the greek stigma = sign, point, stigma) is constituted by a tiny cylindrical lens which has the characteristic feature of deforming the image when it is not perfectly in focus, any is the focal length of the lens used, and at all distances.The split screen, which guarantees the math finally focus at any distance with any focal length, is covered by patents worldwide, marking it a real discovery in the vast domain of photography. No one had thought of before! The optics, it is not even ready the Italian one, is completely French. 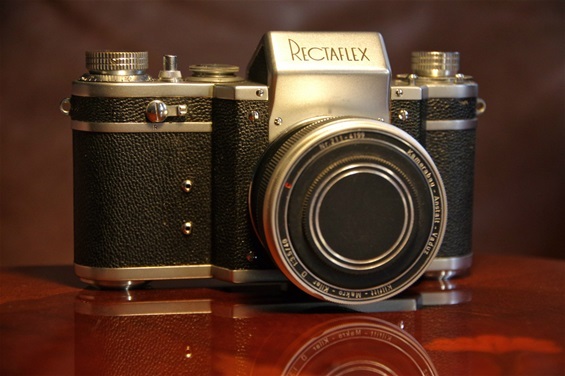 Angenieux in all its editions F: 2.9 5 cm F: 1.1 5 cm in series.&nbsp;</span><span title="Alla Fiera di Milano del maggio 1948 appare finalmente la Rectaflex Mod. Standard 47 completamente funzionante. 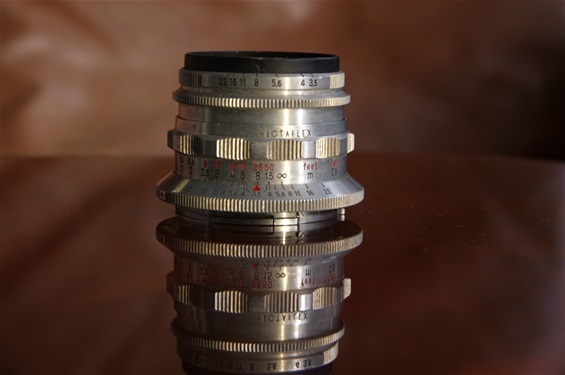 ">In the list we also find the Angenieux 10 cm up, as well as the classics Berthiot from 1 .1.5 3.5 from 55 mm to 35 mm, and - on request - the famous Boyer Saphir 1.1,4 10 cm. The slow motion of time, so much admired by the meticulous Swiss engineers, and mounted on non-synthetic rubies, is a jewel of modern and reliable watches. 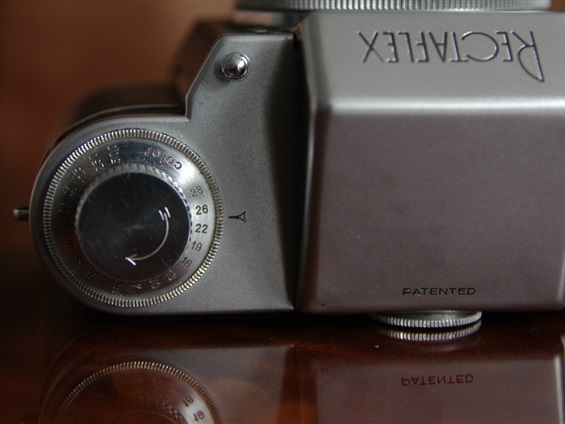 The optical part of reflection is monolithic (patent Rectaflex). That is insensitive to moisture, shock, heat. The entire interior is anodized, that is unalterably. Reveal and ribbons in processed rubber fabric and pure silk, insensitive to light because sheltered from the reflex system. Bushings bronze gears reported on the mass. All parts of duralumin are treated so as to be insensitive to moisture, weathering, and a surface hardness equal to that of corundum. List with all spare parts, photographed and numbered in the event of an accident. The Rectaflex is delivered to the customer sealed inside a luxurious Plexiglas hood which was to become an ornament for cigarettes or playing cards ... Match won! The construction of the factory. After the Fiera di Milano, with many orders in the portfolio - it seems to be at least 300 only for the Italian market - and with interesting open negotiations with some foreign traders, begins the real phase of the productive organization of the Rectaflex. Corsi went to the extraordinary meeting of the Board of Directors of the CISA, and the preliminary contracts from foreign distributors in hand. It comes with the assurance of an appropriation very conspicuous Refers to 300,000,000 lire, for the construction of the new area at the SARA, and to finally begin mass production. In June of 1948, meanwhile, comes a second eight-page brochure entitled Rectaflex, the SLR magic. Annex brochure you will find the list n.2, in which are presented the same items of the first order, but, for the most part, be increased by about 15% in the price. In the early autumn of 1948 will begin the construction of the wing intended completely to Rectaflex, by raising a portion of the existing premises. Is erected a new four-storey building, in the typical architectural footprint adherent post-fascist, structured in a very practical way, in the manner of Walter Gropius, with wide stairs to the upper floors, large rooms open-space which receive light large windows facing east. The new building, yellow ocher, is painted the great written Rectaflex, brick-red.The services and the canteen are also completely new and modern. The factory is not delivered completely alone in these places: some departments may be less important or less clean, such as electroplating, painting and the Warehouse, are housed in adjacent buildings. The offices and environments drafters intended to occupy the central building, along or adjacent to those of SARA. It then goes on to commission the equipment - lathes, milling machines, presses, pantographs, all equipment sophisticated for its time! For the construction of the appliance. Changing corporate structure and moves forward with the plan of recruitment. The registered office leaves via Barnaba Oriani and moved to Via delle Muratte at number 43 (premises owned by the CISA Viscose) and the name becomes Soc Rectaflex Srl In this way Corsi comes off more and more from the previous activities of SARA and undertakes the manufacture of the new camera. 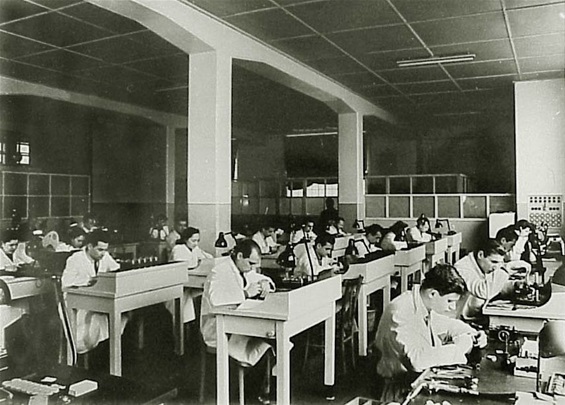 From the books of the Company Rectaflex, and precisely from the records of the staff of the Assembly Department Rectaflex Officine SARA, it is found that the company carries out the recruitment of staff to the first half of 1948, which increased in the autumn of the same year, in line with the launch of production. The workers are trained by the Heads-editors, which are now the handyman, Fraiegari, Judicone and unoccupied. At the end of December are 12 mechanical fitters, all specialists in fine mechanics, the most coming from Officine Navali di La Spezia and the Laboratory of Precision Italian Army. Among the staff employed there are also some women, because of their natural attitude to manual work of precision. The first Rectaflex, assembled by mechanics under the watchful guidance of department heads and Fraiegari Judicone, leaving the new company and go abroad, to feed as much as possible the first demands of the distributors. Probably the first foreign distributor is the Director Products Co. of New York is added immediately after the Exclusivité Thelos Henry Tieman for France. In addition, other trade agreements, some partially successful, others aborted in the bud, are made in Switzerland (Eschmann of Lausanne), South America (Optica Beri, Caracas), Australia (Puccini) and South Africa. 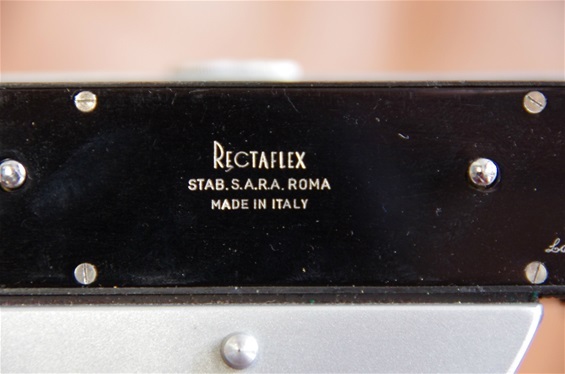 The Rectaflex intended for export are marked with special symbols, burdened on the black plate that covers the internal delay, for the United States is engraved Exp N. 1 and for France Exp S. Progress Photo announces, in the October 1948: "The Rectaflex is already on sale abroad alone for the moment, and Italy are the lucky few who are already in possession of the car." It seems that there are almost practically delivered cars this year in Italy. A strange trade policy that undertaken by the company. The fact is that the marketing department, which depends marginally from classes, already has orders in hand (or promises) with different foreign distributors and want to honor them, even for introitare currency. Neglecting the Italian market, thinking of dealing then through a network of sellers when the assembly line will work at full capacity, is perhaps a fatal error that will be later on, when the domestic market will not respond as expected precisely because of a neglected penetration. Telemachus course does not hide its aims: to produce a technical object with the same quality and excellence of a German equivalent. 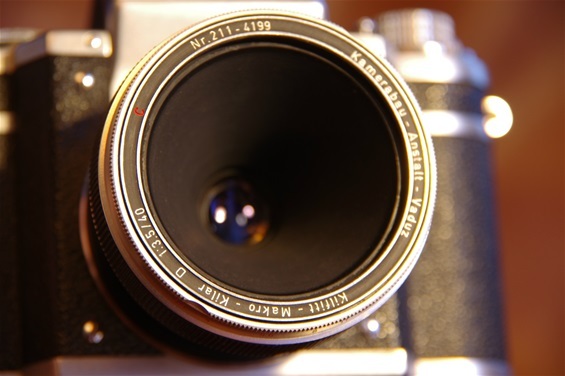 The goal of course is identified with the Leitz and Zeiss. This continuous search for technical perfection, also made of simple construction, the door - plus in the first person - day after day to experiment with new solutions and to make new changes on the equipment during assembly. The everything slows down, however, the construction which is always fragmented by continuous modifications and rearrangements and grow at a phenomenal machining costs. The different changes (or variations) can be born and die during the production of a contract, and are not necessarily present in the devices manufactured later. The parts that undergo more changes, in those early years, are precisely the prism, the back and the body made of aluminum alloy. A few changes are subject to the apparatus of the tendon and perhaps none of the retarder slow. 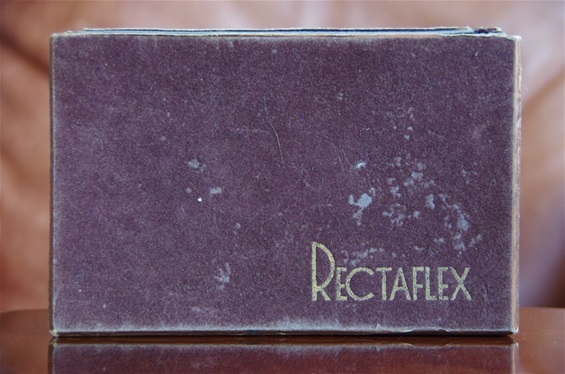 No apparent change seems to involve the external structure of the Rectaflex. Several are in the first period, the Rectaflex who returned to the factory to be re-checked and modified, and many are the machines that do not then passing the final test, they remain in warehouses. B.2173 sier de, men vet ikke om det er rett. Det finnes en del forhandler av klassiske kameraer rundt i verden,slik den i Nederland, men ingen i Norge,så vidt jeg vet. Jeg har heller ikke sett noe på finn. Uten bilder av s.nr. på kameraet samt andre viktige deler, bør du være forsiktig. Hva slags objektiv? Virker lukker? Osv. Det finnes et par seriøse i NL. Ja, vet det ikke var noen forhandlere her i Norge, tenkte på forhandler av brukte Rectaflex. Serienummeret kan jeg få tak på fra butikken i Holland. Takk for svar. Jo, de er gamle, men det går bra. Jeg liker gamle kamera. Noen tips på forhandler/verksted? Ikke lett å finne så mye om dem. Oi, her var det mye god informasjon. Men, kan du hjelpe meg? Hvordan er kvaliteten på Rectaflex kameraene? Jeg ser på en Rectaflex 2000. Rectaflex var kvalitetskameraer. Men de er ca 65 år gamle, og lukkergardinene, f.eks, går sjelden like presist som før. 2000 serien er blant de mer sjeldne. Just another question! 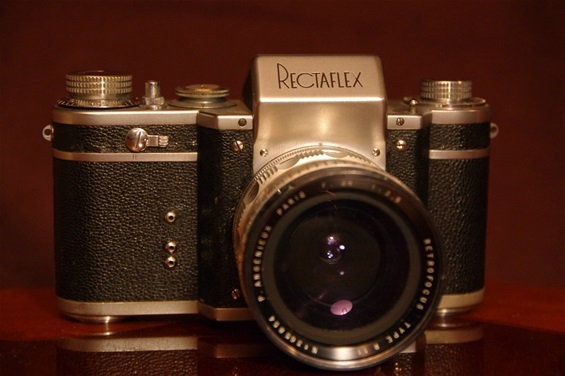 I have a Rectaflex 30000 with red sn.31035 but another sn in the inner bottom side 31031. Is it common for those models to have 2 sn's?.. Hi, Yes, it is common. The first series had the same number on many parts, while later ones could have different numbers outside/inside. Sn. always outside.